Are you suffering from acid reflux, GERD, Gout, upset stomach, nausea and heartburn from a sour or acidic stomach? Then read and learn how you can avoid or reverse all of these symptoms by adding the right alkalizing foods and nutritional supplements to your diet! Acids, alkali, pH…are important scientific measurements for all those who paid attention in biochemistry class because this article will tell you exactly why and how these words are important for your core health and overall well-being and vitality. Every time your stomach feels like it’s on fire, your joints ache, or you feel a burning sensation in your chest—it is because there is a pH imbalance in the biochemistry within the interstitial fluids of the Interstitium, the blood plasma and the intracellular fluids of the body. And, it is the base, acidity mechanism, or the potential of hydrogen in your body, that measures this balance. If we go back to school where we studied the pH, the pH scale runs from 0 to 14, where 7 is the midpoint. The human body maintains the blood plasma, interstitial fluid and intracellular fluid pH within a tight range of 7.365 to 7.400. Any pH in these body fluids above 7.4 indicates compensated alkalosis and any pH below 7.365 indicates decompensated acidosis. The blood will always push-out any increase of metabolic or dietary acids into the compartments of the interstitial fluids of the Interstitium for storage. 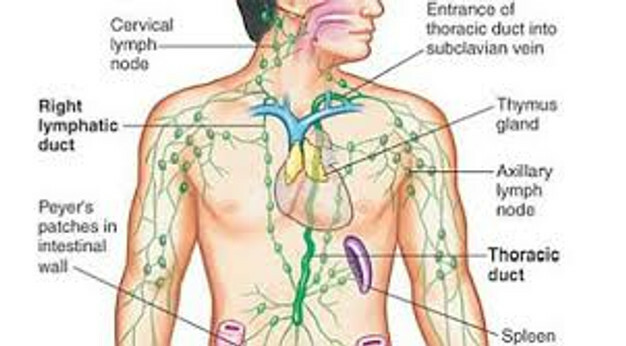 These acidic and toxic wastes from metabolism and diet are held in these compartments until the lymphatic system can remove them via urination, defecation, respiration, menstruation and/or perspiration. This removal of acidic waste stored in the compartments of the Interstitium happens when your calf muscles contract. This contraction or flexing of the calf muscles activates the lymphatic system to pull acid waste out these compartments of the Interstitium for removal. In the case of decompensated acidosis in the interstitial fluids of the Interstitium, the body will pull alkaline minerals, like calcium from the bones and magnesium from the muscles to protect the delicate pH balance of the blood plasma and intracellular fluids. So anytime you are experiencing a sour stomach, an upset stomach, acid reflux, nausea, GERD or heartburn are ALL symptoms the body’s need for alkalinity in the blood, interstitial and intracellular fluids. Always remember that hydrochloric acid is a waste product of sodium bicarbonate in the production of sodium bicarbonate to buffer the acids from acidic foods and liquids and the metabolic waste from cellular metabolism of the organs, tissues and glands of the body. Therefore, the stomach is NOT an organ of digestion but the main organ to alkalize the food we eat, the liquids we drink, the air we breath and the emotions we emote. The stomach is an organ of contribution and its major and only contribution is to create sodium bicarbonate to maintain the alkaline design of the body cells and body fluids outside those cells. 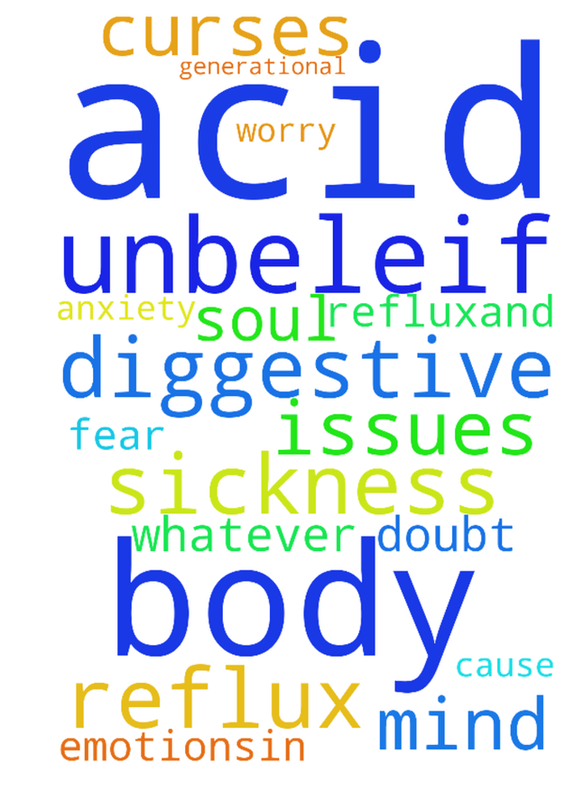 Have you ever created an upset stomach with just your thoughts? Have you ever created nausea from the increased metabolism when over-exercising or when pregnant? 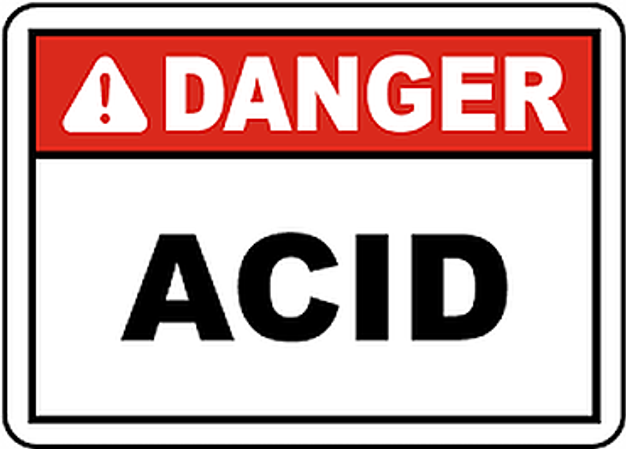 Have you ever created heart-burn from eating and drinking acidic food? Have you ever had a charlie-horse from stored acids in the interstitial fluids of the calves? Have you ever felt the acidic acids in your joints and/or muscles from exercise or over-exercise? Have you ever had to throw-up to remove the increased acids in the stomach? All of these conditions are the result of NOT too much acid but too little sodium bicarbonate in the stomach, bowels, blood plasma, interstitial fluids of the Interstitium and the intracellular fluids inside ALL body cells! The biggest problem is that when eat and drink acidic foods and you have an acidic lifestyle, your stomach MUST produce sodium bicarbonate to chelate these acids to keep YOU alive. In cases of chronic acidity, your body will leach out sodium, potassium, magnesium and calcium from the softer parts of your bone, muscles and organs in order to maintain the optimal pH iof 7.365! This is why chronic acidity is the cause of stomach pains, nausea, acid reflux, GERD, ulcers, joint pain, muscle pain, arthritis, infectious disease, heart disease, diabetes, cancer and finally Sepsis or systemic dietary and metabolic acidosis (the number 1 cause of death in Hospitals around the World). Does the pH levels differ in different parts of the body? The answer is a resounding NO if you are perfectly healthy! The pH level in our body fluids should be the same throughout. 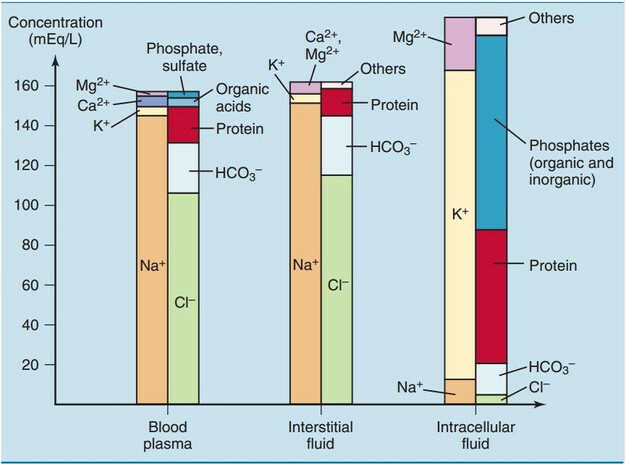 Ideally, human blood, the interstitial and intracellular fluids are all alkaline and should be at a pH value of 7.365. The stomach is the main alkalizing organ that is secreting sodium bicarbonate at a pH of 8.4, into the stomach to alkalize the food ingested. It is secreting sodium bicarbonate back into the blood plasma, interstitial fluids and the intracellular fluids to maintain the alkaline design of the organs, glands and tissues. In addition, the stomach is supplying the salivary glands, the gallbladder, the pancreas and intestines with sodium bicarbonate to secret on the food in preparation for biological transformation in the small intestines. 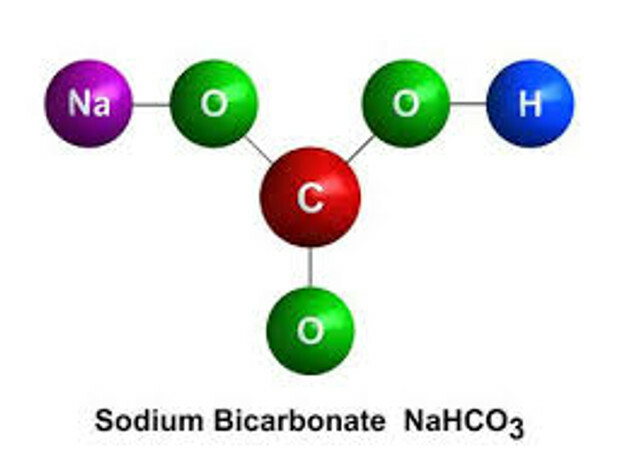 As the stomach produces sodium bicarbonate in all of these functions it creates an acidic waste product or ash called hydrochloric acid, at a pH of 1.5 to 2.00. The hydrochloric acid or HCL falls into the gastric pits away from the food and liquids and the sodium bicarbonate is taken up by the food to increase its pH. Once again, the stomach does not digest food but alkalizes the food and liquids ingested to bring the pH of the food or liquids up to an ideal pH of 8.4. This is necessary in order for the foods or liquids ingested to be biologically transformed into stem cells and then red blood cells in the crypts of the small intestines. The health and aging of the body is in direct relationship to the health of the intestinal villi of the small intestines. When there is damage to the intestinal villi or congestion in the crypts of the intestinal villi then healthy stem cells and blood cannot be produced. This forces the body to begin producing stem cells and then red blood cells out of bone, muscle or other body cells. I call this process reverse transformation. 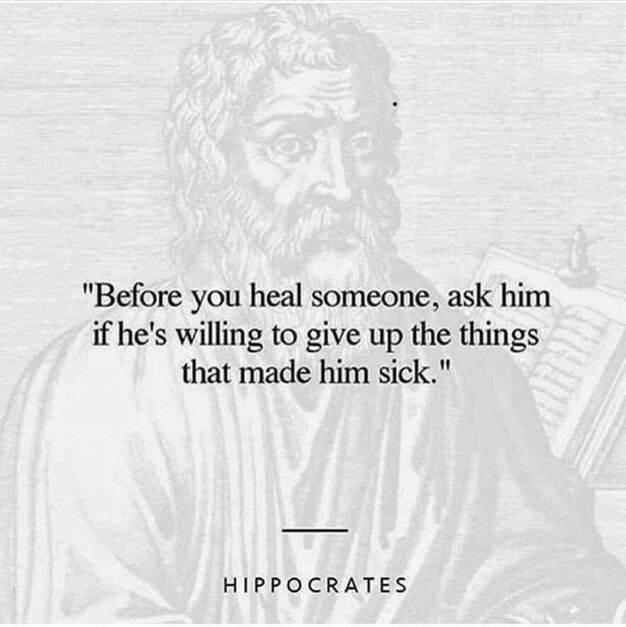 This is why patients who are sick or who eat animal protein, including beef, chicken, pork, duck or fish, causing constipation and congestion of the intestinal villi begin to lose weight, because the body cannot NOT make stem cells or red blood cells from solid food. When this happens the body is forced to make stem cells and blood out of body cells rather then form the four basic foods needed in a liquid state at a pH of 8.4 to make stem cells and blood. The four basic foods are chlorophyll, oil, water and salt! The symptoms of an imbalanced body form imbalanced or acidic pH body fluids? Urine tests using pH or litmus paper are the most popular ways to test the interstitial fluids of the Interstitium. The urine is a product ot the interstitial fluids and NOT of the blood. The ideal pH of the urine should be 7.4 and above. The most acidic time of the day is 3am in the morning so the best time to test your urine for an accurate reading is when you first wake up. We now offer a non-invasive blood plasma and interstitial fluid test for testing the biochemistry, including the pH of the blood, interstitial and intracellular fluids! This is significant because we are then able to determine if the patient is in compensated or decompensated acidosis, oxidative stress, alkaline mineral deficiencies, and whether or not their is bone or muscle loss due to acidosis. This test, is revolutionary since it is non-invasive and non-radioactive. We call these tests the 3D Full-Body Bio-Electro Scan and the Non-invasive blood tests which gives us over 150 parameters of the blood plasma and interstitial fluids without drawing or staining or centrifuging one drop of blood. 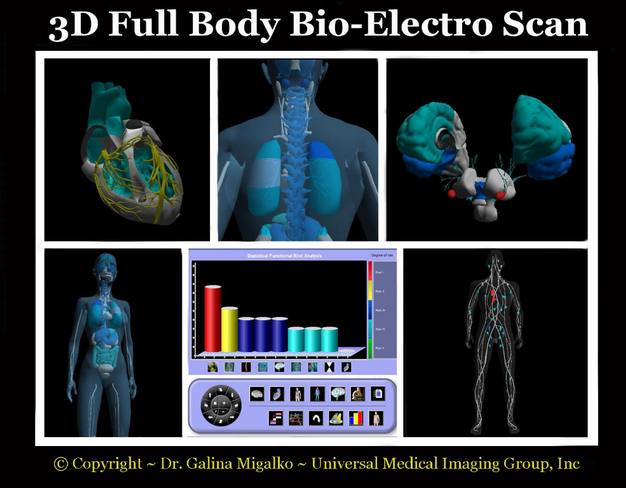 The information obtained from these scans is immediate and can determine accurately the biochemistry of ALL the body fluids and the health of ALL organs, glands and tissues and their healthy or unhealthy condition! 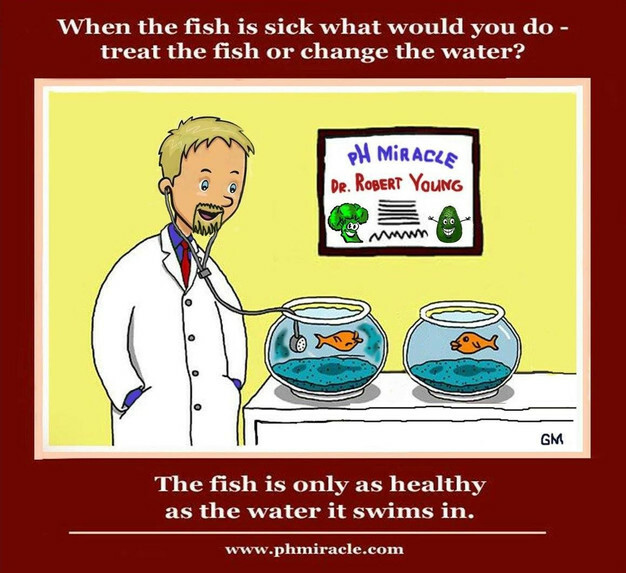 A metaphor I like to use to explain my non-invasive/non-chemical approach to the treatment of any sickness or disease begins with a question, “If the fish is sick what would you do, treat the fish or change the water?” Before you answer this question ask a child this question and he or she will give you the correct answer! The answer is a test of YOUR common sense not your intellect! When the pH levels of the blood plasma, interstitial and Intracellular fluids NEED Alkalinity What Are the Symptoms? The main symptoms of a base deficiency are upset stomach, acid reflux, nausea, GERD, heartburn, a burning sensation in the chest, burps, indigestion, joint pains, burning sensation while urinating, ulcers, bloating, flatulence, diarrhea, constipation, suppressed white blood cells, and increased outfections (bacteria, yeast and mold being born out of the unhealthy body cells called incorrectly by conventional medicine as an infection) just to name a few symptoms of an alkaline deficiency! 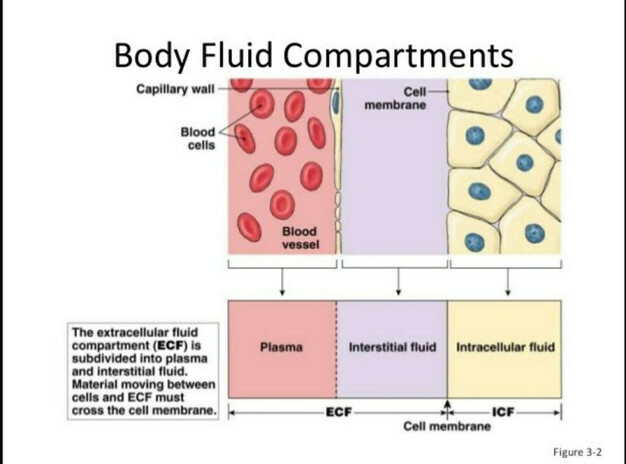 and the intracellular fluids of the body. Alkaline foods are able to reduce acidity, fight acid caused inflammatory conditions, support the white blood cells, help heal the lining of the core, preserve joint health and improve organ, gland and tissue function. Nature has given us some of the most base or alkaline foods, which is why it is very easy to support and maintain the right pH level with a natural organic plant-based green diet. The instant packaged and processed foods or drinks are introduced to the body, there is an immediate decline of the pH of the blood and interstitial fluids. I know this because Dr. Galina Migalko and I are the only scientists in the World testing these fluids and then comparing these fluids for determining the health and well-being of the body and the efficacy of any traditional or conventional medical treatments. In other words, what works and what doesn’t work. Can YOU Over Alkalize the Body? Absolutely NOT! It is Impossible! This is a scientific myth! You cannot over-alkalize the body fluids! The biochemistry is too extreme. 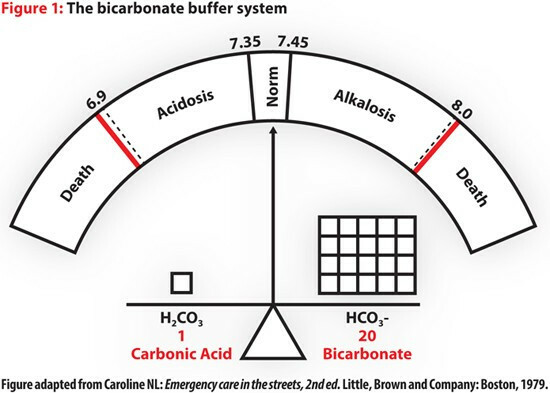 For example, it takes 20 parts of base in the form of sodium bicarbonate at a pH of 8.4 to buffer an acid of carbonic acid with a pH of 3.5 to maintain a base or alkaline pH of 7.35 to 7.45. How Do I Test the pH of The Body Fluids? Testing the pH of the body fluids is the single most important measurement you can do in managing and maintaining the alkaline design of the body! It is important to understand that any food or liquid with a pH less than 6.8 such as coffee, black tea, alcohol, animal flesh, dairy products, vinegar, soda drinks, sport drinks, chocolate, just to name a few, will cause a loss of alkaline mineral reserves and compromise the alkaline design of the body fluids leading to sickness and disease. For a normal healthy and active person who drinks at least one liter of 9.5 purified alkaline water per 30 kilos of body weight and at least two liters of organic iJuice Super Greens with 1 scoop of iJuice Super Chlorophyll (www.ijuicenow.com) per liter and one to two portions of organic green vegetables and fruit in the form of salad, is a a protocol that will prevent or even reverse any health challenge. What are a few of the most powerful alkaline foods and liquids to add to your diet for preventing and/or reversing upset stomach, acid reflux, nausea, GERD, heartburn, constipation, inflammation, heart disease, diabetes, and even cancer! Imbibed fresh or as a dry juice powder of broccoli, spinach, kale, green cabbage, leafy greens makes the most alkalizing green drink because they are ALL extremely rich in minerals like sodium potassium, magnesium and calcium. iJuice Wheatgrass is unlike any other health food. Here are several reasons to incorporate iJuice Wheatgrass into your daily diet. iJuice Wheatgrass can be used to treat skin diseases such as eczema and psoriasis. While no clinical studies have been conducted as yet to support this, many testimonials of home treatments with wheatgrass seem to prove this claim. If you have a few pounds to lose, iJuice Wheatgrass may be the answer. iJuice Wheatgrass contains selenium, which is crucial for the healthy functioning of the thyroid gland. Wheatgrass is loaded with so many nutrients that your body isn’t lusting for other foods to compensate for any lack of vitamins or minerals. Some common nutrient deficiencies — such as magnesium, iron, and omega-3s — can make you snack as your body searches for a source of these much-needed minerals. Wheatgrass is highly alkaline and high in nutrients, making it the perfect tool for a detox. 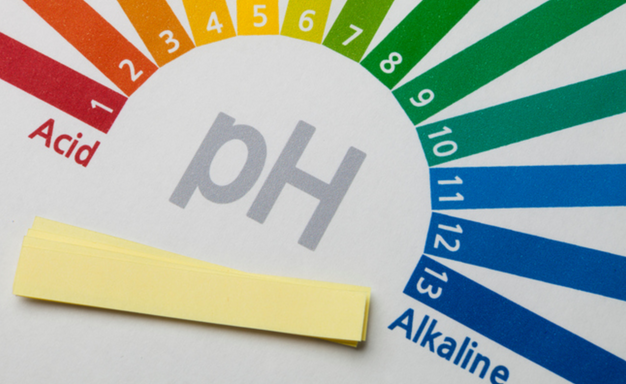 While the jury is still out on whether alkaline diets can truly change the alkalinity or acidity of your blood, nutritionists agree that by eating an alkaline diet, we inadvertently end up eating healthier. Wheatgrass has the ability to increase the amount of oxygen in the blood, making it a great way to stimulate circulation. While a 2008 study in the Internet Journal of Alternative Medicine showed that wheatgrass does not significantly increase the blood oxygen levels of resting individuals, a follow-up study in the same journal showed that wheatgrass did, in fact, increase oxygen levels when taken directly before exercise. To take advantage of this benefit, drink a glass of iJuice Wheatgrass before beginning your regular exercise regime. Instead of reaching for antacids to relieve heartburn or indigestion, introduce Wheatgrass into your daily regimen. 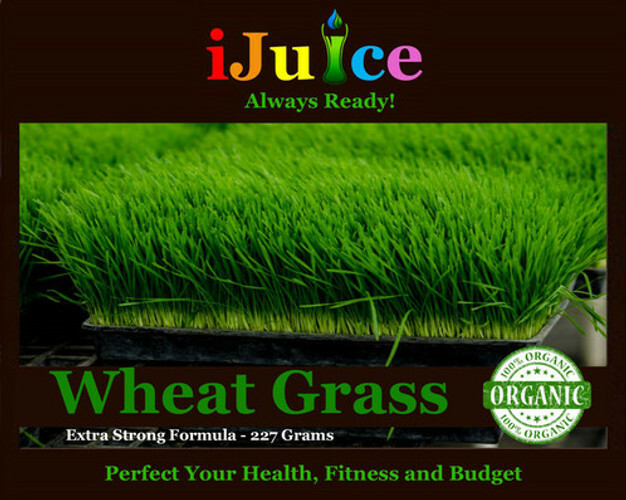 iJuice Wheatgrass juice contains several elements that can boost digestion, including a great deal of fiber, and B complex vitamins, which boost the function of the muscles of the digestive system. In general (B complex vitamins) help move energy obtained from food into the tissue cells, where it is needed. Thiamine helps convert carbs into energy, and riboflavin keeps the mucosal lining of your digestive tract healthy; iJuice Wheatgrass contains both. When you experience fatigue, your body is likely deprived of rest and is dealing with a weakened immune system. Not only does chlorophyll boost the immune system, it also helps to increase oxygen supply in your body’s cells and tissues, contributing to cell regeneration, which heals the body and reduces fatigue symptoms. Chlorophyll is also naturally regenerative for the adrenal glands, according to Ellen Tart-Jensen, Ph.D, D.Sc. Boosting the adrenal system is crucial for sufferers of chronic fatigue. Wheatgrass has natural antibacterial and antimicrobial properties that can increase mouth health and reduce the risk of cavities and gum inflammation when drunk. This stems from the chlorophyll contained in iJuice Wheatgrass, which, according to a study in 2007 study in Revista Sul-Brasileira de Odontologia, is so powerful in its antimicrobial properties that it was shown to have effects on curing candida albicans, which may mean that wheatgrass can help treat cases of oral thrush as well. 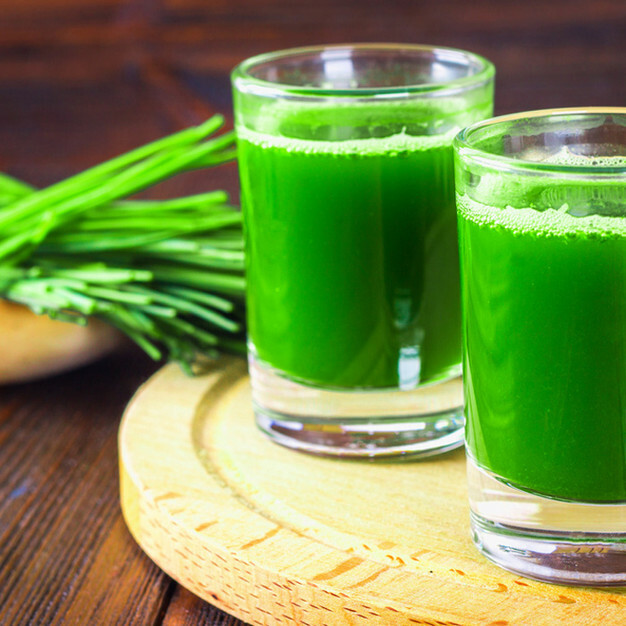 Wheatgrass is probably best known for its effects on the liver. The liver processes what the body ingests, and with its detoxifying properties, nutrients, and antioxidants, iJuice Wheatgrass is able to restore and revitalize this crucial organ. 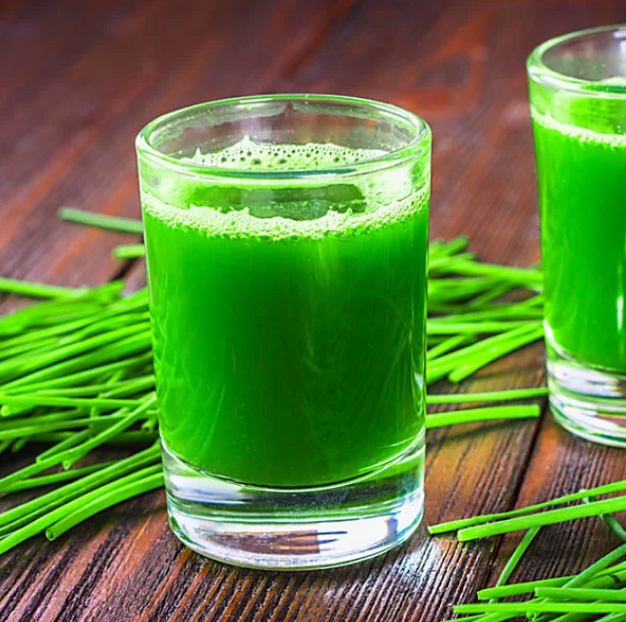 A 2014 study in the Journal of Membrane Biology showed that wheatgrass consumption could even protect the liver against the detrimental effects of alcohol. Wheatgrass improves lipid levels, which means it’s a great tool for managing high cholesterol. A 2011 study in Acta Poloniae Pharmaceutica showed that wheatgrass reduced hyperlipidemia in rats and could be a tool to aid in reducing cholesterol. Wheatgrass’ antibacterial benefits and its ability to reduce chronic inflammation combine to make wheatgrass an excellent tool to reduce acne and occasional breakouts. Wheatgrass’s anti-cancer benefits stem from its blood oxygenating ability; cancer thrives in a low-oxygen environment, so wheatgrass may contribute to cancer prevention in this way. In addition, Parikh notes, “Wheatgrass has enzymes that fight carcinogens and reduce the toxic load of radiation, pollution, and heavy metals.” Just remember that since wheatgrass’ ability to oxygenate the blood is activated with exercise, pair your wheatgrass shots with your favorite workout. Steer clear of colds by drinking Wheatgrass juice to boost immunity and make sure your body is getting all the vitamins it needs. Wheatgrass can improve your mood in a variety of ways. Not only, according to a 2014 literature review in the Asian Journal of Pharmaceutical Technology and Innovation, does it boost the adrenal system thanks to its vitamin K and magnesium content, helping your body to better deal with stress, but it’s also rich in iron. A deficiency in iron can cause fatigue, which worsens mood and makes you feel blasé and unenthused, according to the Mayo Clinic. In addition to iJuice Wheatgrass’ general anti-inflammatory qualities, it has been proven to fight inflammation in the bowel linked to several diseases including Crohn’s and IBS. Wheatgrass has shown to be a powerful anti-hyperglycemic agent in a 2016 study in Toxicology and Industrial Health. The study showed that wheatgrass could be beneficial for those suffering from diabetes or other hyperglycemic issues. This makes it a fitting supplement for those with diabetes or who are trying to reduce blood sugar levels. The chlorophyll in Wheatgrass fuels the body with oxygen, thanks to its ability to increase red blood cell health. Oxygen is vital to many body processes, especially for the brain, which uses 25 percent of the body’s oxygen supply. Wheatgrass is, quite literally, brain food. If you’re trying for a baby, get a glass of Wheatgrass into your breakfast too. Chlorophyll is liquefied sun energy and by consuming as much chlorophyll as possible will basically bathe our inner organs in sunshine.No life is possible without chlorophyll, the blood of plants – just as hemoglobin is the blood of the body – the difference between the two molecules being that chlorophyll contains magnesium, while hemoglobin contains iron. Therefore, chlorophyll through a plant based diet will be high in magnesium. Since ancient times chlorophyll has served as a miraculous healer, carrying a significant amount of oxygen with it and therefore playing a critical role in supporting our aerobic (good) bacteria. The more we consume, the better our intestinal villi and overall health will be. Chlorophyll has been proven helpful in preventing and healing many forms of cancer and atherosclerosis, whilst adequate scientific research has found that there are hardly any illnesses that could not be helped by chlorophyll. Greens are the only living thing in the world that can transform sunshine into food that all living creatures can consume – there would be no life on our planet without greens – as the life purpose of all greens is to produce chlorophyll. With high oxygen content in chlorophyll and a high mineral content in green plants, greens are the most alkalizing food that exists on the planet – heavy in alkaline minerals. 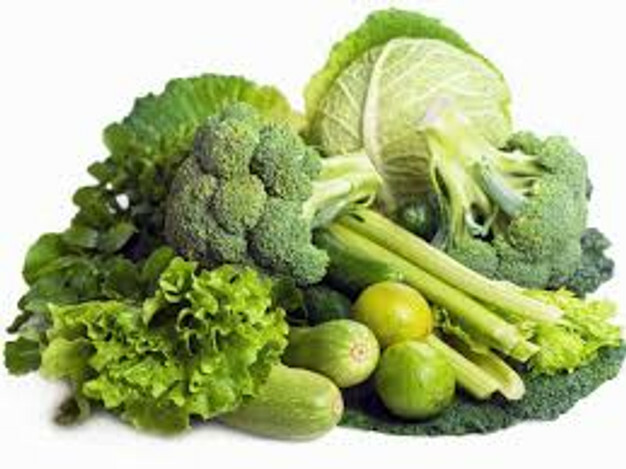 By including greens in our diet we can keep our body alkaline and healthy. The health benefits of Sprouts make up quite an impressive list, and they include the ability to improve the digestive process, boost the metabolism, increase metabolic activity throughout the body, prevent anemia, help with weight loss, lower cholesterol, reduce blood pressure, prevent neural tube defects in infants, protect against cancer, boost skin health, improve vision, support the immune system, and increase usable energy reserves. Sprouts may refer to a number of different vegetable or plant beans in the period of time after they begin to grow. The most common sprouts that people regularly use in their diet are soy, alfalfa, and broccoli sprouts, as well as various other types of bean sprouts. The reason that so many people turn to sprouts as a source of food is that they represent a much more significant amount of vitamins and nutrients than they do in an un-sprouted form. Typically, a week after sprouting, the sprouts will have the highest concentration and bioavailability of nutrients. Seeds and beans must contain a packed storehouse of all the important nutrients that a plant will need to grow in its initial days, so those tiny caps are filled with important organic compounds, vitamins, and minerals that our body can also utilize. There are a number of different cultures that highly value sprouts as an essential element of their cuisine. Although sprouts can be cultivated anywhere that beans are grown (which is basically anywhere in the world), Asian nations seem to have adopted soy and bean sprouts as a topping for various dishes, as well as a common ingredient in salads more than most other countries in the world. They are readily available no matter what market you go to, however. The important thing to remember is that much of the nutritive value of sprouts is lost when they are heated. In other words, although they are a very important source of nutrients and beneficial health boosts, they should always be added to meal in their raw form to guarantee that they have the most impact. Let’s explore some of the components of sprouts that make them such a powerful, yet overlooked, source of so many health benefits. All of the nutritional and medicinal benefits of sprouts are derived from their impressive vitamin, mineral, and organic compounds content. Sprouts contain a significant amount of protein and dietary fiber, as well as vitamin K, folate, pantothenic acid, niacin, thiamin, vitamin C, vitamin A, and riboflavin. In terms of minerals, sprouts contain manganese, copper, zinc, magnesium, iron, and calcium. Many of these component nutrients increase dramatically as the sprout continues to develop. Along with all of those components, sprouts are also a rich source of antioxidants that are essential for health. It is best to eat sprouts that first opened one or two weeks earlier. 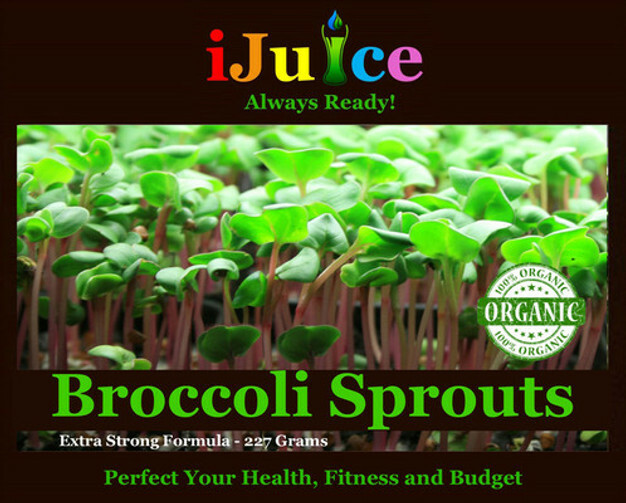 Now, let’s explore some of the fascinating and vital health benefits of iJuice Soy Sprouts, iJuice Alfalfa Sprouts and iJuice Broccoli Sprouts hold for us! Digestion: One of the best things about sprouts is that they contain an unusually high number of enzymes. This can help boost the various metabolic processes and chemical reactions within the body, specifically when it comes to digestion. Enzymes are an important part of the digestive process, and they help to break down food effectively and increase the absorption of nutrients by the digestive tract. 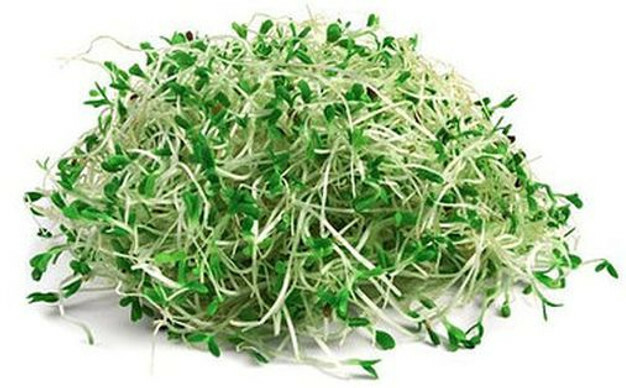 Furthermore, the dietary fiber found in sprouts makes it a very important boost for digestive functions. Fiber bulks up the stool, making it easier to pass through the digestive tract. Furthermore, dietary fiber stimulates the alkaline gastric juices, which aid the enzymes already found in sprouts in breaking down food effectively and efficiently. Sprouts are a great way to clear up constipation, as well as diarrhea, and can even prevent colorectal cancer. Metabolic Booster: As was already mentioned, Sprouts contain a wealth of enzymes that usually aren’t available through food. This major influx represents a kick start for the body, and can seriously impact the metabolic activity of your body. Beyond that, sprouts also contain a significant amount of protein, which is the essential part of food that allows our body to perform all of its chemical functions. Protein is necessary for almost all bodily processes, particularly the creation and maintenance of cells, organ repair, skin regeneration, bone growth, muscle development, and a number of other very important aspects of health. This means that sprouts are an easy and delicious way to improve the overall functioning and development of your body. This high nutritive content is also why sprouts are so highly recommended for vegetarians and vegans, since meat is such a traditionally important source of protein. 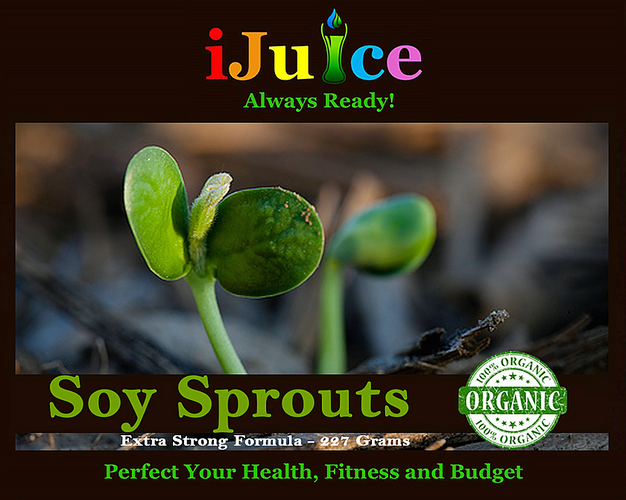 iJuice Soy Sprouts can replace that source of protein for many people. Anemia and Blood Circulation: Anemia is the technical word for an iron deficiency. If you don’t consume enough food with iron, your red blood cell count drops, because iron is an essential part of red blood cell production. This can result in fatigue, lack of concentration, nausea, light-headedness, and stomach disorders. By maintaining your red blood cell count with proper amounts of iron (and copper, which is also found in iJuice Sprouts), you can improve the circulation of blood in your body, thereby increasing the oxygenation of organ systems and cells to optimize their performance. Weight Loss: Sprouts are one of those foods that are very high in nutrients but very low in calories. This means that you can eat sprouts without worrying about compromising your diet. Furthermore, the fiber in sprouts helps to make you feel full, both by adding bulk to your bowels, but also by inhibiting the release of ghrelin, which is the hunger hormone that tells our mind that we are ready to eat something. This can reduce overeating and snacking, two of the biggest problems for someone suffering through the problems of obesity. Heart Health: Sprouts are a great source of omega-3 fatty acids, and although these are technically a form of cholesterol, they are considered “good” cholesterol (HDL cholesterol) and can actually reduce the amount of harmful cholesterol in your blood vessels and arteries. Omega-3 fatty acids are also anti-inflammatory in nature, so they reduce the stress on your cardiovascular system in that was as well. The potassium content of sprouts also helps to reduce blood pressure, since potassium is a vasodilator, and can release the tension in arteries and blood vessels. This increases circulation and oxygenation, while reducing clotting and lowering the risk of atherosclerosis, heart attacks, and strokes. Infant Health: Neural tube defects are one of the most common side effects of a deficiency in folate, a member of the B vitamin complex. Sprouts have a significant amount of folate, thereby protecting your infant from this tragic condition. Immune System: The are a number of factors that make iJuice Sprouts a powerful booster for the immune system. Its vitamin-C content alone makes it a powerful stimulant for the white blood cells in the body to fight off infection and disease. Furthermore, as a sprout continues to develop, vitamin A can multiply almost ten times its original content. Vitamin A has a number of antioxidant properties that make a great source of immune system strength. Cancer Prevention: The antioxidant activity of the organic compounds found in sprouts make it a very good anti-cancer choice for your diet. The vitamin C, vitamin A, as well as amino acids and proteins (including the huge amount of enzymes) can also impact the free acids content in the body. Metabolic and dietary acids are the natural, dangerous byproducts of cellular metabolism that can cause healthy cells to mutate into cancerous cells. They are also responsible for some heart diseases, premature aging, cognitive decline, and a variety of age-related health concerns. iJuice Sprouts can counteract these effects, thereby helping to reduce the chances of developing cancer. Vision and Eye Health: Vitamin A has been associated with an improvement in vision health for many years. It acts as an antioxidant agent to protect the eyes’ cells from free acids. In this way, sprouts can help prevent glaucoma, cataracts, and macular degeneration. In fact, vision can even improve in some cases, so eat your sprouts and start seeing the world a bit more clearly! Cold Sores: Cold sores can be an unsightly, painful, and uncomfortable condition to suffer through. If they get infected, they can even become a serious health risk. There is a specific enzyme, called lysine, that actually inhibits the growth of cold sores and treats them if they do appear. This enzyme is conveniently found in significant amounts in sprouts! Allergy and Asthma: Some varieties of sprouts, like iJuice Broccoli Sprouts, have been linked to reducing allergic reactions, including asthma, which is an inflammatory condition of the respiratory system. Although the exact chemical pathway is not fully understood, additional research is being done on this topic all the time. Contrary to what people believe, lemons are not acidic. Lemons are low in sugar and high in sodium and potassium bicarbonate and contribute alkalinity to the body fluids and therefore is know as an electron donor. Add fresh organic lemon juice to a glass of warm water and drink it every day to neutralize the hydrochloric acid in the gastric pits of your stomach for better health. The health benefits of lemon can be attributed to its stimulating, calming, carminative, anti-infection, astringent, detoxifying, antiseptic, disinfectant, sleep inducing, and antifungal properties. The benefits of lemon include its ability to treat stress disorders, fever, infections, asthma, obesity, insomnia, skin disorders, hair conditions, stomach problems and tiredness. Lemons are one of the most popular citrus fruits in the world, and are widely used for culinary purposes, since they are a good source of vitamins and aid in digestion. It also adds a pleasant taste and aroma to food. 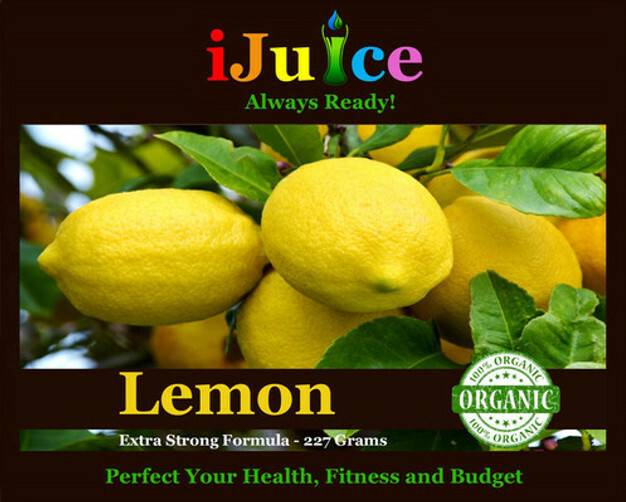 Furthermore, lemon juice is one of the most popular drinks in the world as it is very healthy, delicious, and inexpensive. Skin care: Lemon oil is a good remedy for increasing the luster of dull skin. It is astringent and detoxifying in nature, and rejuvenates sagging or tired-looking skin. Its antiseptic properties help in treating pimples and various skin disorders. Lemon is also recommended for reducing excessive oil on the skin. 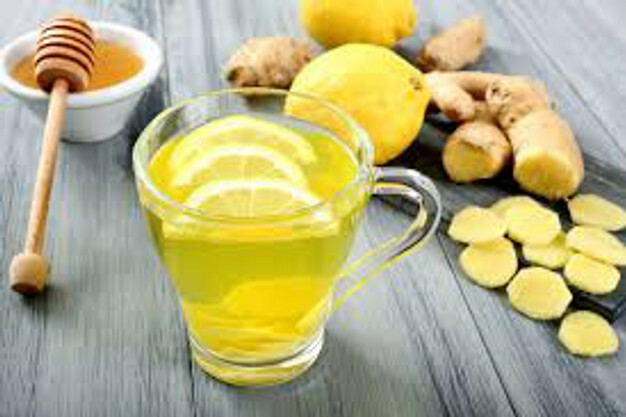 Stress: Lemon is calming in nature and therefore helps in removing mental fatigue, exhaustion, dizziness, anxiety, nervousness and nervous tension. It has the ability to refresh the mind by creating a positive mindset and removing negative emotions. It is also believed that inhaling this oil helps in increasing concentration and alertness. It can therefore be used as a room freshener in offices to increase the efficiency of the employees. Immune system: Lemon has a high vitamin content, which makes it a wonderful booster for the body’s immune system. It further stimulates white blood cells, thus increasing your ability to fight off diseases. It also improves circulation throughout the body. Hair care: Lemon oil is also effective as a hair tonic. Many people use this oil to get strong, healthy and shiny hair. It is also used to eliminate dandruff. Weight loss: Lemon is very helpful in reducing weight, and satisfying appetite to reduce the chance of overeating. Fever: Lemon is effective against infectious diseases such as fever, malaria and typhoid. Cleaners: Lemon is a good cleaner, which is why it is used for cleansing the body, metal surfaces, dishes, and clothes. It is also a disinfectant, so it is commonly used for cleaning surfaces such as butcher’s knives and blocks that can get contaminated very easily. Perfumes: Lemon oil has a distinctly refreshing aroma which makes it a good ingredient for perfumes. Many scented candles contain lemon oil, and it is also used in potpourris. Soaps and cosmetics: Lemon juice and lemon essential oil are both used in soaps, face washes and many other personal care and skin care cosmetics due to its antiseptic quality. iJuice Lemon Essential oil blends well with many other iJuice essential oils including iJuice Lavender Essential oil, iJuice Rose oil, iJuice Neroli essential oil, iJuice Sandalwood oil, iJuice Geranium essential oil, iJuice ylang ylang essential oil, iJuice tea tree essential oil, making it a popular oil for herbalists and those who practice the healing art of aromatherapy. 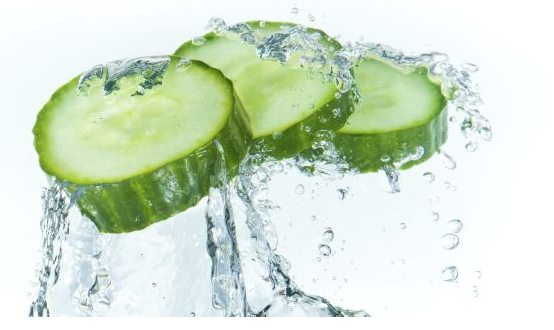 Cucumber is 90 per cent water and rich in alkaline minerals. It keeps our body hydrated, eliminates toxins, cleanses and buffers the acidic levels as well. Cucumbers also prevent acid crystallization or stones in your body, so add it to you salads and your fresh juices. 15 Alkalizing Reasons to Eat Cucumbers and Drink iJuice CUCUMBER Juice for Daily! Cucumbers are the number four most cultivated vegetable in the world and known to be one of the best foods for your overall health, often referred to as a super food. Pick a handful of firm, dark green cucumbers and blend them into a fresh organic green drink or slice up and add to any salad or soup. or simply take 1 scoop of Juice Cucumber and mix it in a glass of alkaline water – Congratulations! You have just ingested one of the most alkalizing of all fruit full of good health! Drinking iJuice cucumber may help to relief from heartburn. You can also make a poultice and apply iJuice Cucumber on your skin and you will get relief from sunburn. All the Cucumber Health & Fitness juice acts as a virtual broom, sweeping waste products out of your body. With regular drinking, iJuice cucumber may help to dissolve k.
Cucumbers have most of the vitamins the body needs in a single day. A, B and C, which supports your immune system keep you radiant and give you energy. Make it more powerful by juicing cucumber with spinach and kale. Don’t forget to leave the skin on because it contains a good amount of vitamin C, about 12 percent of the daily recommended allowance. Cucumber is high in potassium, magnesium and silicon. That is why spas abound cucumber based treatments. Due to its high water and low calorie content, cucumber is an ideal source for people who are looking for weight loss. Use cucumbers in your soups and salads. If it is not your favorite snack you can crunchy cucumber sticks with creamy low fat yogurt dip. Chewing cucumber gives your jaws a good workout and the fiber in it is great for digestion. Daily consumption of cucumbers can be regarded as an aid for chronic constipation. Placing a chilled slice of cucumber over puffy eyes is a clichéd beauty visual but it really can help reduce under-eye bags and puffiness due to its anti inflammatory properties. Cucumber is known to contain secoisolariciresinol, lariciresinol and pinoresinol. 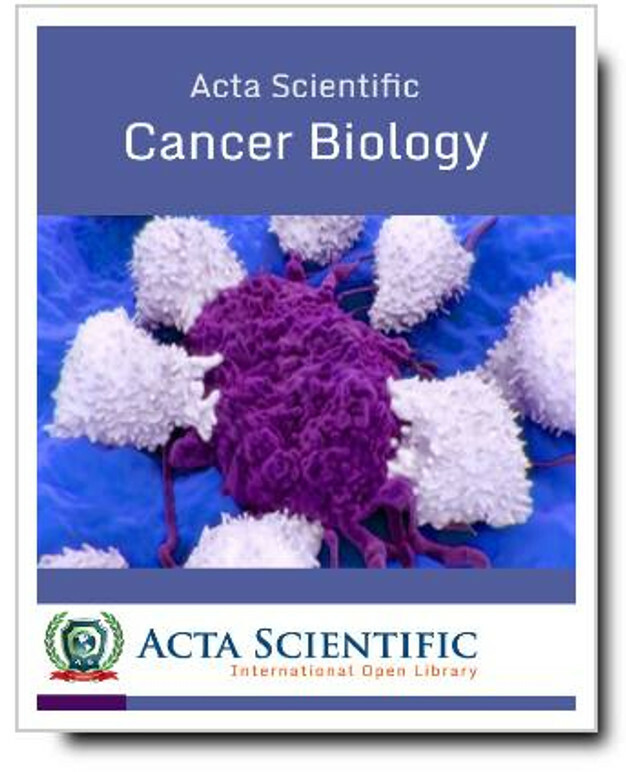 The three lignans have a strong connection with reduced risk of several cancer types, including ovarian, breast, prostate and uterine cancer. Cucumber juice contains a hormone which is needed by the cells of the pancreas for producing insulin which is widely spread to be beneficial to diabetic patients. Researchers have found that a compound called sterols in cucumbers can help decrease levels of cholesterol. Cucumbers contain a lot of fiber, potassium and magnesium. These nutrients work effectively for regulating blood pressure. That is why cucumber is good for treating both high blood pressure and low blood pressure. Cucumber juice heals and refreshes diseased gums. Get a slice of cucumber and press it to the roof of your mouth with your tongue for a half minute, the phytochemcials will kill the bacteria in your mouth responsible for causing unpleasant breath. The wonder mineral Silica in cucumber makes your hair and nails shinier and stronger. The sulfur and silica in cucumbers help to stimulate your hair growth. As cucumber is an excellent source of silica it promotes joint health by strengthening the connective tissues. When mixed with carrot juice, cucumber can relieve gout and arthritis pain by lowering levels of the uric acid. To avoid a morning headache or hangover you can eat a few cucumber slices before going to sleep. Cucumbers contain enough B vitamins, sugar and electrolytes to replenish many essential nutrients and reducing the severity of both hangover and headache. Cucumber lowers uric acid levels in your body and though keeping the kidneys healthy. Cucumber is high in potassium, magnesium and silicon which are alkalizing minerals making them number 1 in alkalizing the alimentary canal, blood, tissues and interstitial and intracellular fluids. Celery is a strongly alkaline food that helps to counteract acidosis, purify the bloodstream, aid in digestion, prevent migraines, relax the nerves, reduce blood pressure, and clear up skin problems. Celery contains compounds called coumarins which are known to enhance the activity of certain white blood cells and support the vascular system. Celery’s rich organic sodium content has the ability to dislodge calcium deposits from the joints and holds them in solution until they can be eliminated safely from the kidneys. 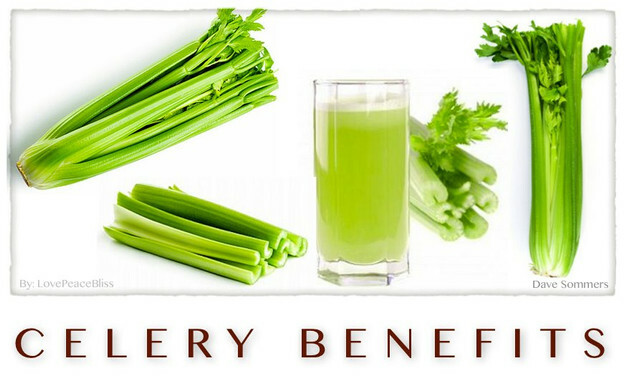 Celery is a well known natural diuretic and has ample ability to flush toxins out of the body. Celery also has significant anti-inflammatory properties making it an essential food for those who suffer from auto-immune illnesses. It also contains significant amounts of calcium and silicon which can aid in the repair of damaged ligaments and bones. Celery is rich in vitamin A, magnesium, and iron which all help to nourish the blood and aid those suffering from rheumatism, high blood pressure, arthritis, and anemia. There are some amazing Avocado benefits for your health and appearance. If you would like to lose weight, improve your skin and lower your risk of many life-threatening diseases like cancer, diabetes and heart disease, here’s why it’s well worth including more of this extremely healthy fruit in your diet. 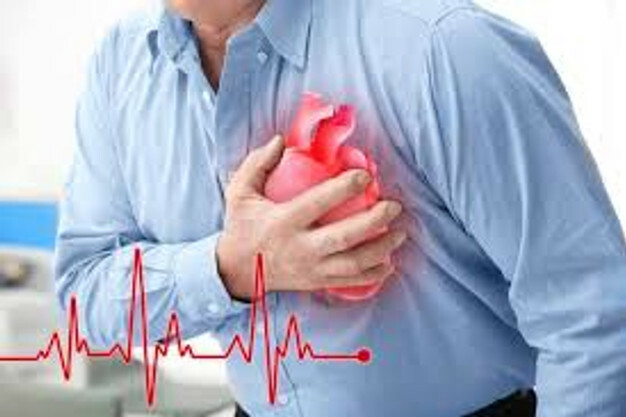 Coronary heart disease is still the biggest killer in the USA and UK and it is essentially a disease of inflammation. Many experts now believe that high consumption of pro-inflammatory processed vegetable oils are a significant risk factor in cardiovascular disease. They advise lowering polyunsaturated fat intake and increasing the amount of healthy monounsaturated fatty acids in your diet. iJuice Avocado is an excellent source of monounsaturated oleic acid. Research has shown this beneficial form of fat reduces dangerous metabolic and dietary acids and reduces acid buffering LDL cholesterol in the blood at the same time as increasing the more beneficial HDL cholesterol. Studies like this have found eating and/or drinking avocado can also decrease high blood triglyceride levels, another common predictor of cardiovascular problems. The high levels of vitamin E in iJuice Avocado helps prevent cholesterol oxidation, while their potassium can regulate high blood pressure that may lead to both heart disease and kidney problems. iJuice Avocados are also an excellent source of folate, known to reduce dangerous homocysteine levels in the blood, another predictor of cardiovascular disease. Folate is a nutrient many of us are low in and it is especially important for pregnant women. Many people don’t get enough of the mineral potassium in their diet. This deficiency can lead to high blood pressure, which is in turn a significant risk factor for heart attack, stroke and kidney disease. Avocado is particularly rich in potassium, even higher than the often touted bananas, and a good food to eat for normal blood pressure and a lower risk of kidney failure and heart disease. Avocado is a good source of antioxidant carotenoids like alpha-carotene, beta-carotene, beta-cryptoxanthin, lutein and zeaxanthin. These antioxidants protect your body’s cells against cancerous changes due to metabolic acid damage and are considered your front line of defense against numerous diseases. Alpha-carotene appears to be especially important for cancer prevention. This study found a significantly lower risk of death for cancer and heart disease for those with the highest levels of alpha-carotene in their blood over a 14 year period. The monounsaturated fats in iJuice Avocado also help with carotenoid absorption and studies suggest it has a protective effect against breast cancer in particular. Avocado also contain high levels of vitamin C and vitamin E, themselves potent anti-cancer antioxidants. Vitamin C is considered protective against many non-hormonal cancers, like pancreatic cancer, stomach cancer and lung cancer. Importantly, it appears most effective when it comes from food rather than supplements. Vitamin E deficiency has been linked to breast cancer and studies have found a dramatic reduction in breast cancer risk at higher intakes, especially for women with a family history of the disease. The monounsaturated fats in avocado are also beneficial for improving your skin tone and appearance. They are vital for maintaining good moisture levels in the epidermal layer of your skin that make it look and feel soft and healthy. Diabetes is a disease reaching epidemic proportions and there are believed to be a significant number of undiagnosed sufferers. The most common symptoms of undiagnosed diabetes include a sudden and large increase in thirst and hunger and much more frequent urinating. A dry mouth, significant unexplained weight loss, vision problems and leg pain are also common symptoms. Having more monounsaturated fats in a diabetic diet is also beneficial for reducing high triglyceride levels and may help improve insulin function and blood glucose levels. Additionally, the vitamin E found in iJuice Avocado lowers cholesterol oxidation that can lead to heart attacks and strokes. It may also provide some protection from nerve damage in diabetic patients with peripheral neuropathy. The high levels of potassium in iJuice avocado is another important nutritional factor for diabetics due to the minerals role in maintaining a healthy heart and regulating blood sugar. Osteoarthritis is a painful condition characterized by joint inflammation and soreness that affects millions of people in the USA and UK. 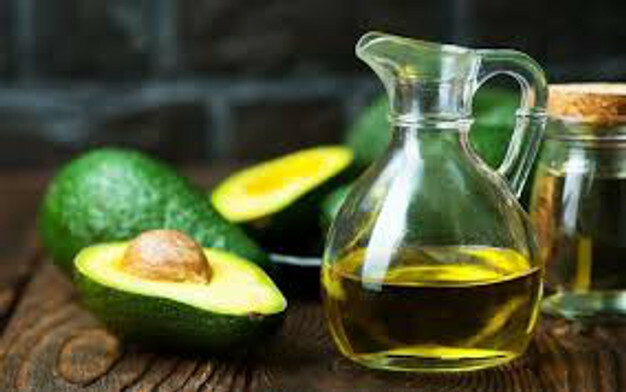 Many common foods like wheat, corn, milk and sugar are known to worsen symptoms, but anti-inflammatory avocado is one of the few foods consistently reported to reduce arthritic pain.iJuice Avocado contains high levels of monounsaturated fats, phytosterols and antioxidants like vitamin E, vitamin C and a variety of carotenoids that can help reduce the inflammation that leads to arthritis. Avocado is a particularly important food for women who are pregnant, and those trying to be, due to its high concentrations of folate (also known as folic acid). This B vitamin is needed to prevent birth defects like spina bifida and doctors advise women to get high amounts of folate both before and during pregnancy. Vitamin K is another valuable nutrient found in high concentrations in avocados that benefit women during pregnancy and their future babies. Despite their creamy texture, avocados are actually a high fiber food, with 8 grams of both soluble and insoluble fiber per cup of the fresh fruit. This fiber is beneficial for improving digestion, encouraging regular bowel movements and well known to help prevent constipation. You may be surprised that a food high in fat and calories like avocado would be recommended for weight loss. However, research has shown that avocado’s monounsaturated fatty acids are much more likely to be used as slow burning energy than stored as body fat. This steady energy and the feeling of satiety or satisfied fullness that you get from iJuice Avocado is one of the reasons they are so good at reducing hunger and appetite. This interesting study, called ‘Avocado consumption is associated with better diet quality and nutrient intake, and lower metabolic syndrome risk in US adults’, found that avocado eaters had a higher intake of vitamins, like vitamin K and vitamin E, and minerals, such as potassium and magnesium. This improved nutritional intake resulted in a significantly lower body weight, body mass index and waist circumference in those that ingest avocados. pHour Salts™ is a combination of four powerful carbonate salts (sodium bicarbonate, magnesium chloride, potassium bicarbonate, and calcium chloride) that help maintain the alkaline design of human, plant, and animal organisms. These salts are naturally occurring in all fluids of the body. Specifically, they can aid in the reduction of acidity in the stomach, blood, interstitial fluids of the Interstitium, lymphatic, circulatory, and gastro-intestinal system. pHour Salts™ may be used daily to increase the alkalinity of any food or drink. Other uses include baking, tooth scrub, mouth wash, deoderizer, bath soak, and foot bath. There’s a reason these seeds are presented at the end of a meal a— they are cooling and alkalizing the Hydrochloric acid in the gastric pits of the stomach. 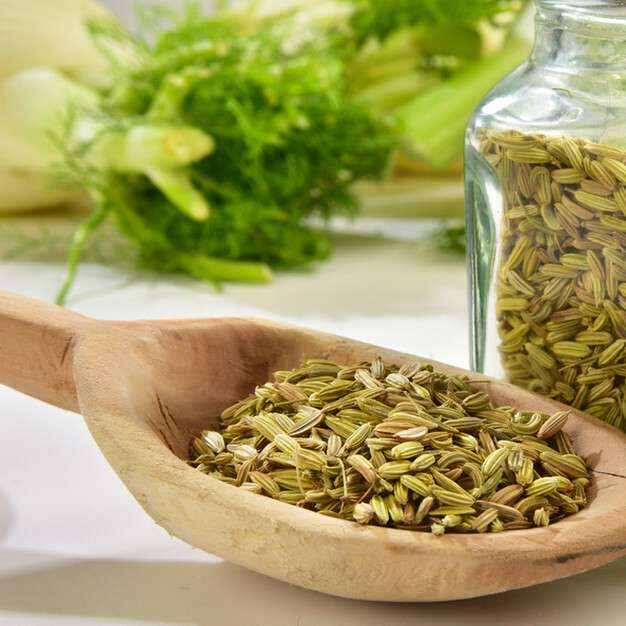 Chew a few fennel seeds to reduce the symptoms of acidity for immediate relief from acids in the stomah. Martin Luther King, Jr. One of the Greatest Freedom Fighters of our time! Free at Last, Free at Last! Thank God I am Free at Last! Several years ago I had the beautiful experience to speak freely at the Martin Luther King Jr Memorial Chapel in Atlanta, Georgia on the campus of Morehouse College by Professor Dean Lawrence Carter, Jr. (below I am pictured with Professor Lawrence Carter, Dean of the Martin Luther King Chapel at More House College, Atlanta, Georgia. When introducing me to speak at the Martin Luther King, Jr. Memorial Chapel, Dr. Carter stated, “Dr. Robert O. Young is the Martin Luther King Jr. of the 21st Century.”) It was one of my greatest memories to stand at the same pulpit where Martin Luther King, Jr., Ikada, Ghandi and Mandela delivered powerful messages of freedom, love and light. There in front of thousands, I was blessed to have the opportunity to share my message of freedom, love and light. A message that has now blessed the lives of millions around the World. Thank you God for the blessing of service in my life. Thank you all for the opportunities you have given me to serve you, my brothers and sisters – my friends. One of my favorite quotes of Martin Luther King, Jr. is one that has impacted my life in so many ways, when he said, “Never, never be afraid to do what’s right, especially if the well-being of a person or animal is at stake. Society’s punishments are small compared to the wounds we inflict on our soul when we look the other way.” Yes, it was hard to be incarcerated for 5 months at the East Mesa Re-entry Facility, but I want you all to know that I have no regrets! Today, I am so grateful to be home with my family and friends. After almost 35 years of studying and learning about acid – base chemistry in vertebrates, and the same number of years attempting to share what I have observed and learned, I am enormously gratified to see the larger scientific community beginning to recognize and validate my work, research and discoveries. It has been a long journey out of darkness. 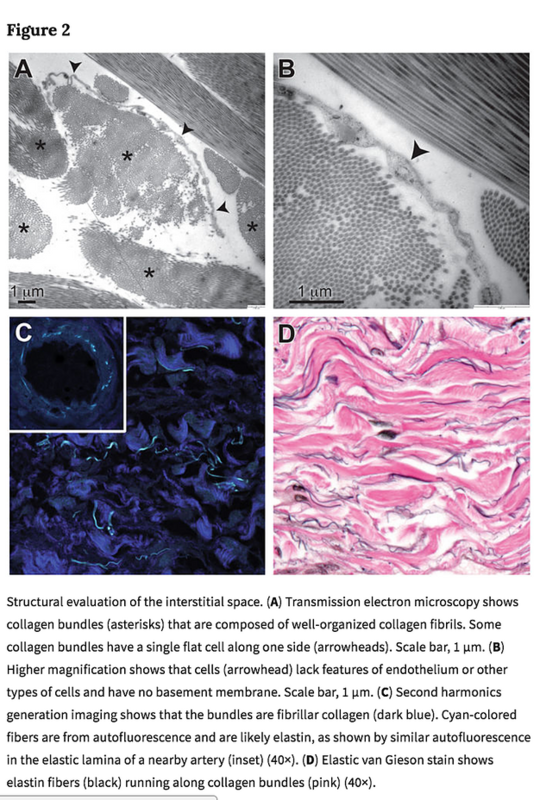 Almost every day now some new scientific paper is published that validates my work, such as the discovery of a new and the largest organ of the body called the Interstitium, which I have been studying for over 25 years. I have lived with doubt and criticism for so long that I have come to understand it as actually encouraging and exciting. No one takes the time to write to a newspaper about something that does not interest them. When people take the time to read, investigate and try to understand and then to sit down and write to an editor to complain, what they are really doing is asking questions; asking the author to explain his or her self; to defend their work. It is wonderfully energetic and encouraging to see people interested and asking questions. Asking questions is the first step towards knowledge. It is a sign of courage and intellectual bravery to ask questions and seek knowledge. We, as humans, live in such profound darkness. Not knowing what is in the dark is a very scary thing. We, like children, need to know there are no boogey men under the bed. The truth is adults are afraid too. We tell our children there are no boogey men, but we still look under the bed ourselves just to be sure. The truth is we don’t know any more than we do know. We live in a Universe of what Donald Rumsfeld, the former American Secretary of Defense, called “Unknown Unknowns”. The more we learn, the more we realize how much we still don’t know. Albert Einstein once quipped, “Intelligence is a very humbling thing. It makes us realize that what the greatest of us knows, pales in comparison to that which none of us knows.” Knowledge is always being accumulated. Much of it disturbs our serenity. We want to believe we know at least most of what is to be known. But, alas, we know so very little. We are much better off today than most humans were when they died in their 30′s, of things like infected teeth, which dentists today deal with so easily, and from minor wounds, that surgeons today routinely stitch up in minor medical clinics. Our knowledge is greater than it was for even our parents. We continue to learn, in spite of our very human desire to believe we already know most of what we need to know. Today it is said that all of human knowledge is compounding about every 3 years. In other words, we will learn more in the next 3 years than we have learned in our entire previous recorded history. My work is in that record. Today the medical professions, and healers around the world are just beginning to understand what I have been teaching for over 3 decades. The very thing that people complain about, is actually a result of the broader acceptance of my work in the scientific community. When someone writes, “I…was shocked to discover a number of UK companies promoting practices and diets based on his theories.” It both excites and encourages me that people are finally beginning to “get it.” I can understand why “getting it” is so unnerving. It recognizes that all along there has been a boogey man under the bed that we did not know was there! The good news is, now that we know that living an acidic lifestyle will make us sick, and accelerate aging and hastens death, we can do something about it! Just like now we can treat infected teeth and stitch up wounds, that once killed us at a very early age. I have had people object to my saying that an HIV, Ebola or Zika Virus does not cause AIDS or disease and that vaccination can protect you. A great percentage of the larger scientific community does not believe that either. Are you familiar with the name Luc Antoine Montagnier? He received the Nobel Prize in medicine for discovering the HIV virus. Where is he NOW? He was a World Famous Professor and Scientist at the University of Paris. In 2011, Dr, Luc Montagnier lost his position at the University of Paris and was exiled to China. Why? Because he reversed his position on the so-called HIV virus, its existence and cause of AIDS. How would I know this? Because we lectured together as the Key Note Speakers in October, 2011 in Milan, Italy and he shared his horrific story with me. I am in good company. The way to shut us all up is not to exile us or to through us in jail, or even kill us like many of my colleges, but for someone to prove that HIV, Ebola or Zika actually does cause AIDS or disease, using the scientific method called, Koch’s postulates. That hasn’t been done, because it can’t be done. HIV, Hep C, Ebola, Polio, Measles and Zika are all phantom viruses. Scientists have never isolated these viruses or proven that they cause any disease. In fact, everyone in Brazil knows that Zika is not a virus and does not cause birth defects. They know that these birth defects are being caused by eating fruit and vegetables that are laced with an acidic toxic chemical called Glyphosate (N-(phosphonomethyl)glycine), a broad-spectrum systemic herbicide and crop desiccant. Some people object to my theory of multi-forms or pleomorphism and the origins of what are called bacteria, yeast, mold and viruses. But, you don’t have to know or understand the origins of these biological forms to understand that if your body is properly alkalized none of them can reproduce and none of them can cause any of the ill effects thought to be associated with them. How these biological forms arise is, and has been for centuries, a great debate. The proof of my work is in the results. For at least a century, it has been known that cancers form and thrive only in overly acidic tissue.” I did not develop that knowledge, I only explained it. Don’t blame the messenger for the message. Diabetes is another condition that has been largely misunderstood. For decades the way the medical community dealt with diabetes was only to treat the symptoms. The symptoms were targeted, because it was not known what causes diabetes. I like to say, we have always known what caused diabetes, we just did not like the answer. The answer has always been, change your lifestyle, and change your diet! But, we humans like our cures to fit our lifestyles not to adjust our lifestyles to prevent the conditions. You want to turn diabetes around over night? Get all of the animal proteins out of your diet, along with all of the simple carbohydrates and sugars, stop drinking acidic beverages, and eating highly acid foods, add back in the alkaline green plants and simply watch what happens. Learn the cause and the self-cure for Type 1 and Type 2 diabetes by reading The pH Miracle for Diabetes! Here is something fun for your family members to do. Go on the Internet and Google “Eggs cause Diabetes.” I have been saying this for years to howls of criticism. Now the larger scientific community is beginning to understand what I have been saying, and my critics are stunned… What!? ALL animal proteins are acidic and cause degenerative conditions we like to call diseases. Sorry.. it’s the message that is not liked. I’m just the messenger. One last thing, I get criticized frequently because I did not receive my DSc. Ph.D. and ND from Harvard or Johns Hopkins, or some other favored institution. I wish I could have afforded those institutions, but the schools I attended were and are fine institutions. Snob appeal does not make a good institution. We just love to establish ranks of exclusions. In the U. S. to have attended a fine engineering school you need to have attended MIT, or Stanford… most recently California Institute of Technology has taken the lead, but the truth is the Indian Institute of Technology in India is widely recognized as the finest engineering school in the World. Institutions do not make the quality of their students. The students make the quality of the Institutions. In fact, institutions do not “teach” creativity or innovation. All institutions do is teach what is presently known, not what is yet to be discovered. More often than not, throughout time, our greatest discoveries have come from individuals with very little formal education, Steve Jobs from Apple, Mark Zuckerberg, the guy that started Facebook and Bill Gates, the founder of Microsoft. Unfettered by dogma and entrenched lore, visionaries look at the world with new eyes and see things others could not or cannot see. What I encourage everyone to do, especially my critics, is to continue to read, study, ponder, listen and learn; take charge of your own health and do what works! This is how I have come to all of my conclusions… watching and studying what works, and building on that evidence. Scholars can argue about WHY an apple falls from the tree, but the important thing is to note is that it does! God bless you all and God bless America with the capacity to love one another and NEVER turn away from a soul who is in need of a helping hand. I promise you it will do your soul good. So to all my loved ones, family, friends and even my critics and enemies, thank you for being in my life! You have all, in your own way, taught me how to care more, love more, serve more, live more and to be grateful for this beautiful opportunity to learn and live together on Earth! PS What Does It Mean to be Truly Free? What is freedom if it is not to be free in every way, from our most minute cell to our most expansive dreams? He is free who can afford to let the interactions between the cell and spirit take place in a most harmonious and loving way. There is no freedom in the philosophies of men. Freedom of that sort lasts for only a duration of a thought, of an act. To be truly free is to be able to establish peace between all opposition within us! To realize that the circumstances of our lives are not important as compared to the kindness, thoughtfulness, acceptance, understanding, and love we show to others. The picture below is a micrograph of healthy live red blood cells seen under pHase Contrast microscopy. To pre-register for one or more World Conferences please email phmiraclelife@gmail.com and receive an additional 10 to 20 percent discount on the listed early-bird pricing. You can also register by phone by calling me direct at: 760 484 1075. Please check out the Countries, Cities, Dates and Pricing on my personal website at: http://www.drrobertyoung.com! 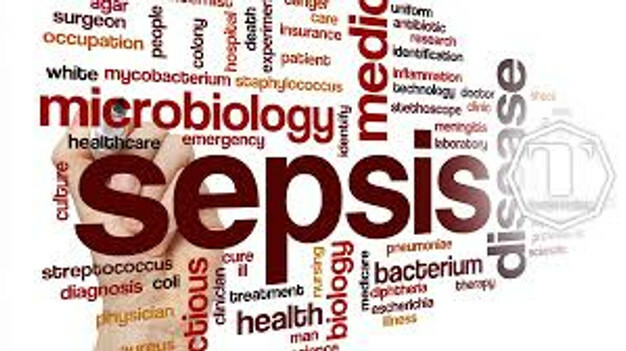 Life and Death is all about managing and maintaining the delicate alkaline pH environment of the blood plasma, the interstitial fluids of the Interstitium and the intracellular fluids of the body cells, at 7.365. You can manage and support all of the body fluids with what you eat, what you drink, what you breathe, what you think and what you believe. Yes, even your thoughts and beliefs produce metabolic acidic waste products that can make you sick and tired. Your thoughts and beliefs do become biology and do affect the pH of all body fluids. Today, medical science teaches that the body regulates the pH of the body fluids automatically and factors such as what you eat, drink, breathe, think or believe have no bearing or influence on the biochemistry of the body fluids. In other words, your lifestyle has NO influence on the chemistry, including the pH of the blood, interstitial fluids or the fluids inside the cells or intracellular fluids! This thinking should and does not make common sense since we do know scientifically that uric acid from eating animal protein causes gout, lactic acid from metabolism and from dairy products causes inflammation and cancer, acetaldehyde and alcohol causes breast cancer, diabetes, and pancreatic and liver diseases, including cancer and the acidic pesticide DDT and glyphosate (the main chemical in the pesticide Round-up) causes birth defects, dementia, polio, measles, MS, Zika and YES cancer. 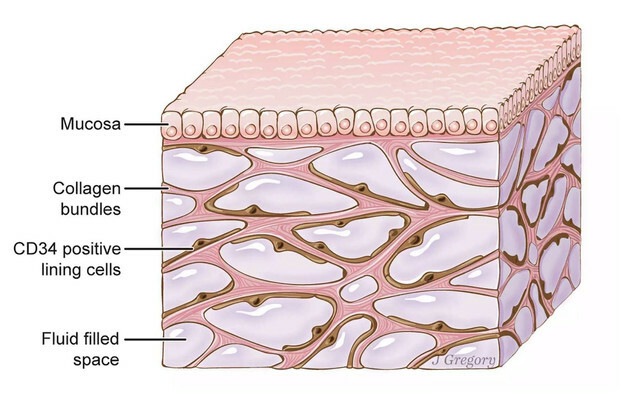 The good news is a medical research group in America just announced last year that they had discovered a new organ in the human body called the Interstitium. Researchers are claiming that this organ is not only the largest organ of the human body but it contains compartments that hold metabolic, dietary, respiratory and environment acidic waste. This acidic waste in the interstitial fluids of the Interstitium is held in these compartments until they can be eliminated via urination, defecation, perspiration, menstruation and respiration. This new anatomical, functional and physiological discovery changes the false belief by the current medical establishment. With new medical technology we can now test the chemistry, including the pH of ALL the body fluids which proves that the Interstitium, I call the third kidney, is holding predominately the majority of all acidic waste in these holding compartments. This is done by the body in order to maintain and protect the delicate pH balance of the blood plasma and keep you alive. Just testing the chemistry or parameters of the blood plasma can and many times will give medical doctors a false positive or false negative. Why? Because all the the normal or negative factors happening in the body can only be revealed by testing the fluids of the Interstitium where all the acidic toxins are being stored, until eliminated through the channels of elimination. When medical doctors make false statements that what you eat, drink, breathe or think does not effect the chemistry of the body fluids, they do not realize that the pH of the interstitial fluids of the Interstitium are being compromised every day by ALL of these factors. 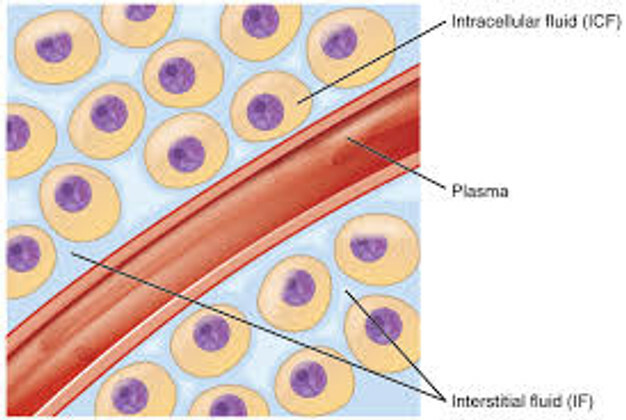 Testing the chemistry of the interstitial fluids of the Interstitium and comparing this information to the chemistry of the blood plasma is critical in correctly determining a real or accurate medical diagnosis! 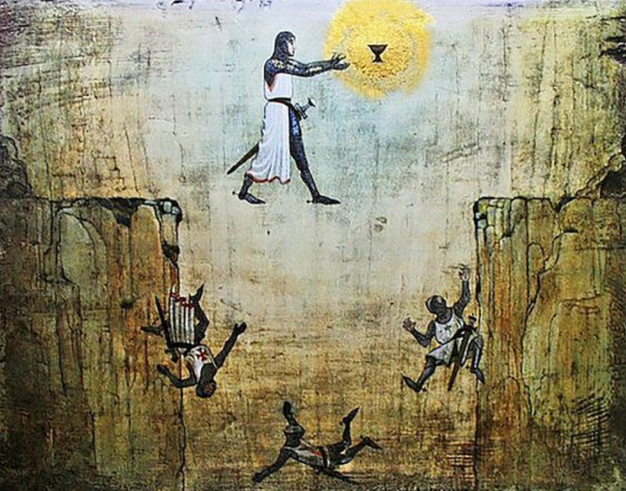 I have determined from my own research over the years that the testing of the Interstitial fluids of the Interstitium is the gold standard in medical diagnostics and the holy grail to prevention, diagnostic, and effective treatments for ALL sickness and disease! Currently, we are the only research and diagnostic group, in the World, testing ALL of the body fluids for chemistry, including pH! Medical Testing and Diagnostics Needs to Change! It is so critical that YOU share this new medical science with everyone you love and care about. Testing the interstitial fluids of the Interstitium will save lives and prevent serious health challenges down the road. It will provide YOU the certainty that your heath practitioner needs to advise YOU correctly on your current health and fitness condition. Measuring and understanding the chemistry of the Interstitium will reveal whether or not your current health and fitness plan is effective and healthful. This would include your nutritional protocol, exercise, or even the legend drugs you maybe taking! No more guessing or diagnosing a health condition based upon symptoms or beliefs or even your doctors beliefs. 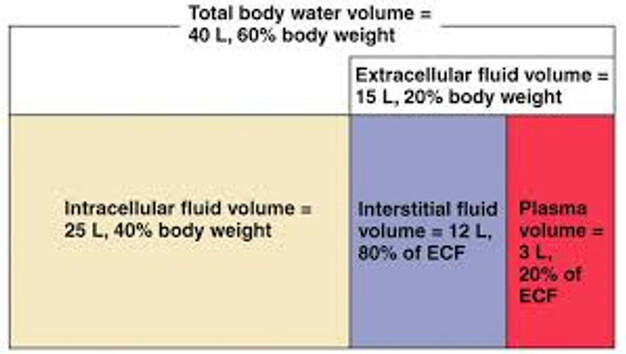 Quantifying the interstitial fluid chemistry is the KEY to understanding YOUR REAL current health and fitness condition! 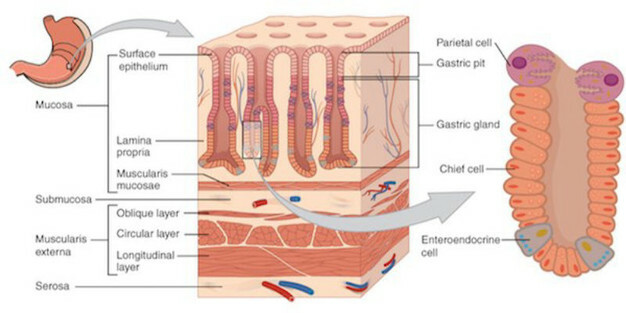 The picture below is a diagram of the breakdown of body fluids (Figure 1) and a cross-section of the largest organ of the human body – The Interstitium (Figure 2). 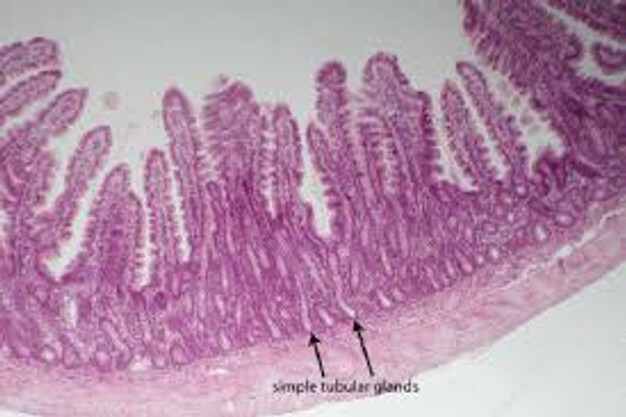 Keep in mind if you ask your doctor about the Interstitium his/her eyes will glaze over because most medical doctors know absolutely nothing about this organ! In fact, medical science just recognized this organ in 2018 – a organ I have been studying for over 30 years! Cystic fibrosis (CF) [1,2] and Pulmonary Adenocarcinoma (PAC)  have similar symptomologies and are chronic, progressive, and frequently fatal acidic conditions of the respiratory system (lungs), lymphatic system (lymph nodes), intestines, pancreas, urinary tract system, reproductive organs and the skin as the alkaloid glands (the salivary glands, stomach, and small and large intestines) produce and secrete alkaline compounds, such as sodium bicarbonate to buffer and preserve the alkaline design of the body and the specific organs and glands affected. These metabolic and dietary acidic conditions resulting in the build-up of mucous  can affect any organ or organ system but primarily affects the respiratory, lymphatic system, digestive, and reproductive tracts in children and young adults with CF and the lungs and surrounding lymph nodes in PAC. I have suggested from my own clinical research that both of these conditions are the result of latent tissue acidosis (LTA) in the interstitial fluids of the Interstitium or the fluids that surround every cell, created from metabolism, diet, thoughts and environment and may be successfully treated and reversed with an alkaline lifestyle and diet (ALD) . The Answer to My Question to YOU! 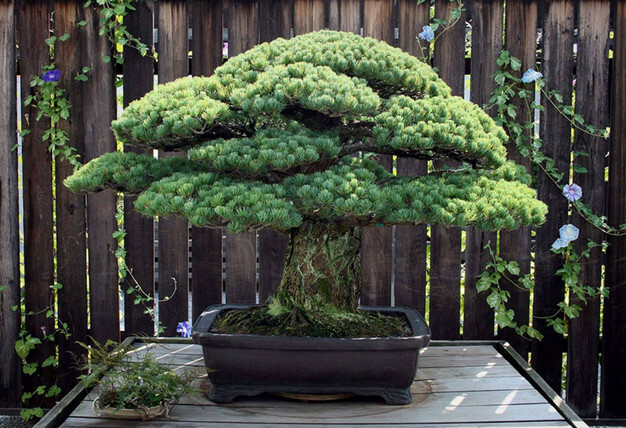 Now, in answer to my question to YOU, “How long do YOU want to LIVE,” I have included a picture of a 400 year old Bonsai Tree to give you a glimpse of the possibilities for increasing your longevity by actively managing and measuring the chemistry of YOUR body fluids, especially the interstitial fluids of the Interstitium. 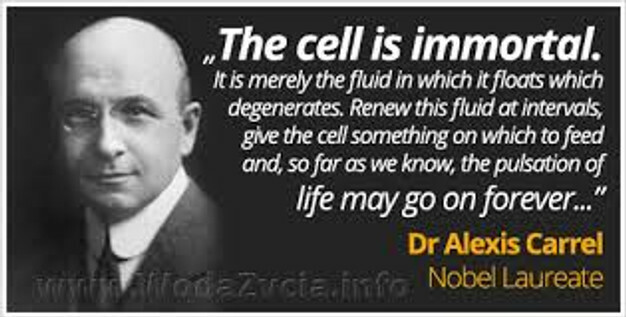 Dr. Alexis Carrel received the Nobel prize in medicine many years after his death for discovering the longevity of the human cell. What did he find? That he could keep a body cell alive forever if he would simply change-out the acidic fluids that surround the cell every 24 to 48 hours. His experiment was with a chicken heart that he kept alive for over 20 years by changing-out the interstitial fluids each day. The chicken heart only died after he stopped managing the interstitial fluids of the heart. You must protect, manage and maintain the alkaline design of the body fluids if YOU want to prevent sickness or disease and extend the quality and quantity of your life! You must be protected just like Dr. Alex Carrel’s chicken heart or the 400 year old Bonsai tree above that was protected by a concrete walled nursery from the atomic bomb dropped on Hiroshima, Japan. 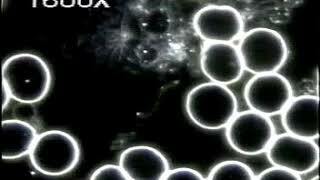 I am suggesting in my work, research and findings that the KEY to a healthy and long life, can be found in the interstitial fluids of the Interstiitum – the environment that bathes every cell of the human body determines how long a cell will live to even the DNA expression and ultimately determines how long YOU will live! 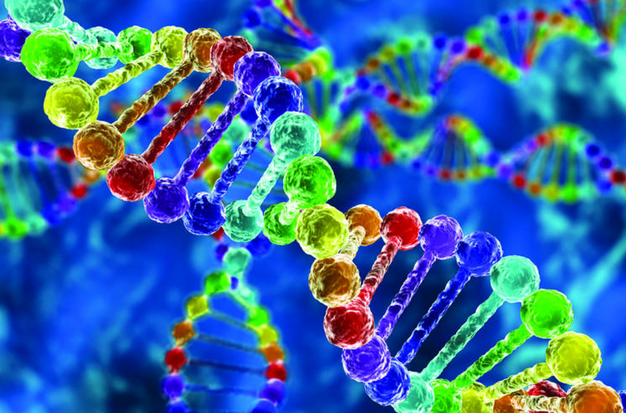 Genes DO NOT Determine YOUR Destiny! The interstitial fluids of the Interstitium determines YOUR Destiny! Life is a choice just as death is a choice. You choose it every day with what you eat, what you drink, what you breathe, what you think and what you believe. So Choose Wisely! Finally, remember that ALL cells of the human body are only as healthy as their environment or the interstitial fluids of the Interstitium, in which they reside and live! What is One of the World’s Greatest Scientific Discoveries Finally Recognized This Year? A New Largest Human Organ Discovery Destroys the So-Called Settled Science of the Immune, Vaccine, Bacterial, Viral, Infectious Diseases and Cancer Theories! What is this NEW LARGEST ORGAN in the Human Body? Where is this NEW LARGEST ORGAN in the Human Body? What does this NEW LARGEST ORGAN do for the Human Body? The Work, Research, Discoveries and Publications of Robert O. 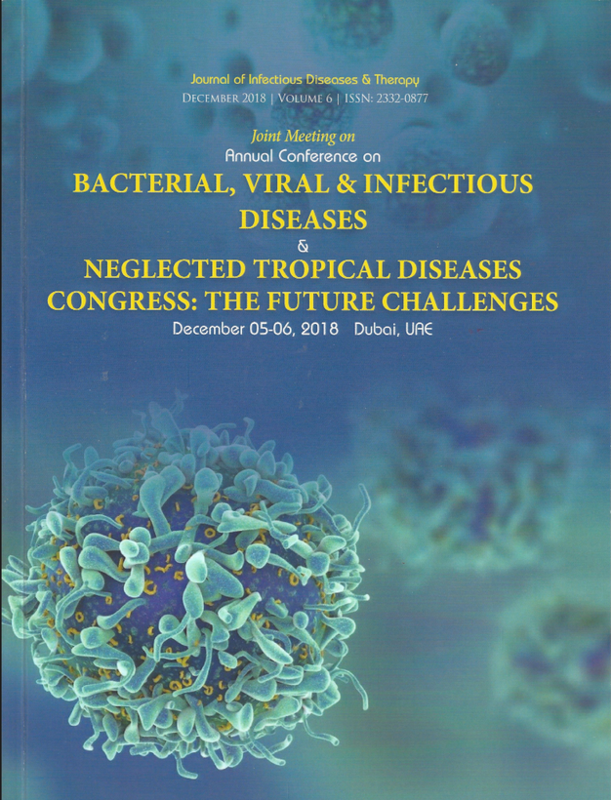 Young CPT, MSc, DSc, PhD, Naturopathic Practitioner and Dr. Galina Migalko MD, NMD were presented this year at the 3rd International Conference for Liver Diseases and Pancreatic Cancer and the Annual Conference for Bacterial, Viral and Infectious Diseases, December 5th and 6th in Dubai, UAE. Science Just NOW Declares a Scientific Discovery of a NEW ORGAN which we have been investigating for over 30 Years and finally published concerning this NEW ORGAN and ORGAN SYSTEM in November of 2015! 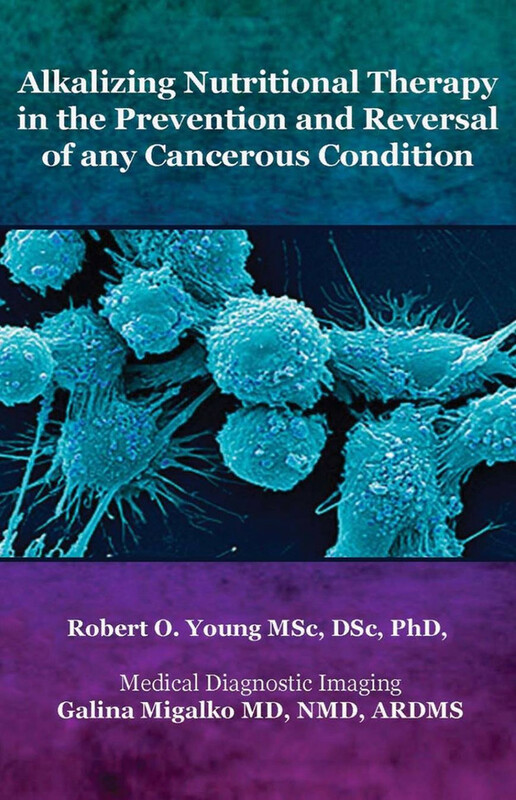 In 2015, Dr. Young and Dr. Migalko published an article in the International Journal of Alternative and Complimentary Medicine on the cause of Cancer and the Interstitium/Interstitial fluid compartments. These compartments when analyzed for pH and electrolytes reveals the truth about the cause and effect relationship of ALL sickness, disease and the efficacy of current medical treatments. Due to the evident ineffectiveness of conventional cancer treatments (e.g. chemotherapy and radiation), more efficient alternatives are needed. The potential of Alkaline Nutritional Infusion (ANI) as a legitimate alternative to chemotherapy and radiation is examined. While largely ignored in conventional oncology, the pH of the interstitial fluids is suggested as paramount in identifying a cancerous condition. It is further suggested that cancer is an over-acidic condition of the body that can be reversed and prevented with alkalizing treatments such as ANI. 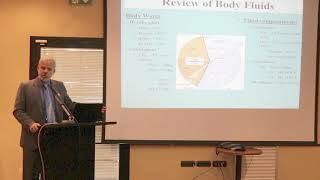 Full Body Bio-Electro Scan (FBBES) is presented as a noninvasive means to examine body pH and the presence of cancer. 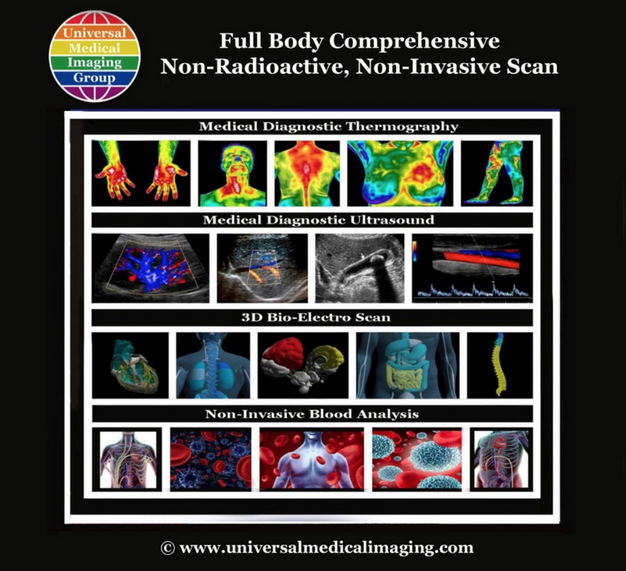 In addition, non-invasive Full-Body Thermography (FBT) and Full-Body Ultrasound (FBU) are presented as a noninvasive means to examine the physiology and the anatomy of the ograns, glands and tissues for inflammation, calcifications, cysts and tumors in the prevention and treatment of any cancerous condition. Finally, Live Blood Analysis (LBA) and Dried Blood Analysis (DBA) are non-invasive hematology tests for evaluating the health of the red and white blood cells and to view inflammatory and malignancy at the cellular level. In contrast to the acidosis caused by conventional cancer treatments, ANI methods such as Intravenous Nutritional Infusion (INI) and Rectal Nutritional Infusion (RNI) provide an alkalizing approach to cancer treatment and prevention. This new organ discovery and the methods for testing its chemistry, including pH were presented by Dr. Robert O. 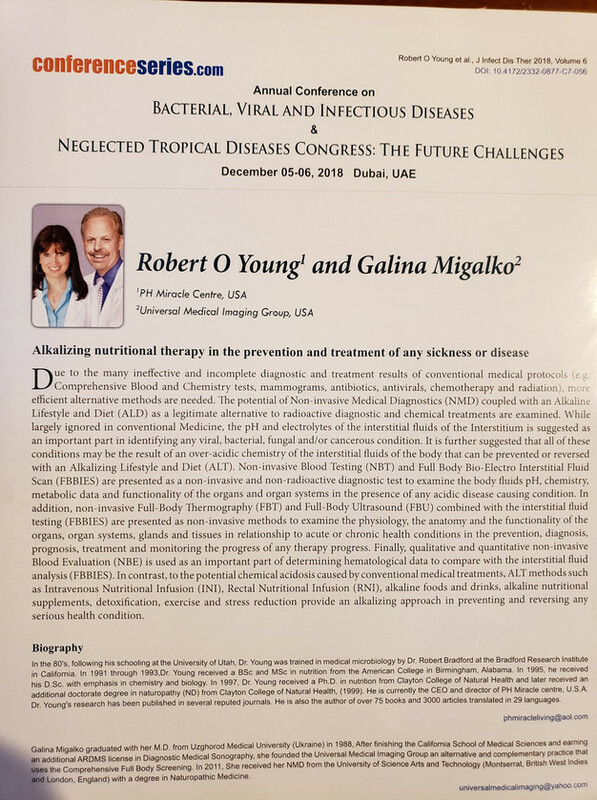 Young and Dr. Galina Migalko at the 3rd International Conference for Liver Diseases and Pancreatic Cancer in Rome, Italy, June 18th and 19th, 2018 and again at the Annual Conference on Bacterial, Viral and Infectious Diseases on December 5th and 6th, 2018 in Dubai, UAE. The abstracts for Dr. Young’s and Dr. Migalko’s presentations are available on request at: phmiraclelife@gmail.com. Please include all your contact information in your email. Which Lifestyle and Diet Did YOU Follow in 2018! Victoria Beckham keeps her slender physique in shape by following the pH Alkaline Lifestyle and Diet, recommended by Robert O. Young PhD. This plan means you ingest ONLY alkaline foods and liquids to keep your acidic levels in your blood, interstitial fluids, intracellular fluids at an alkaline pH between 7.35 and 7.45. 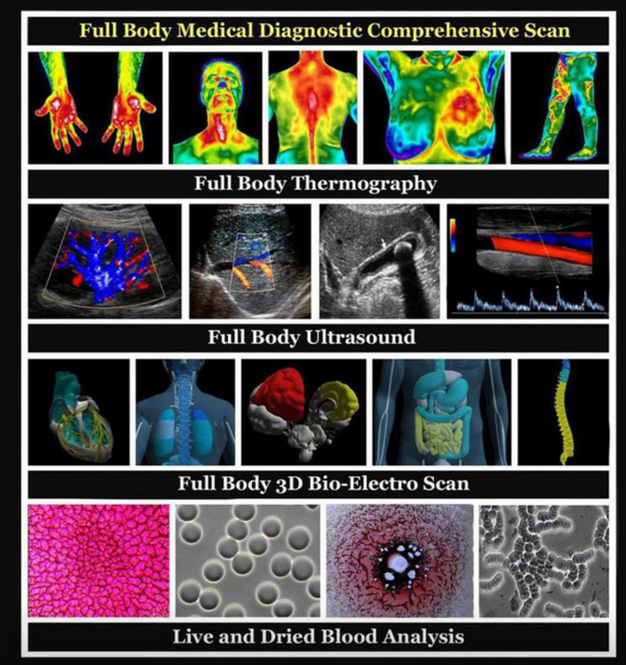 All of these fluids can be tested with the Full-Body 3-D Bio-Electro Scan and the non-invasive blood testing of the chemistry, including pH of the blood, stomach, intestines and interstitial fluids. So where does a 6’7″ man who weighs over 270 pounds get his protein from? Tony Robbins eats broccoli! Over 50 percent of the calories from steamed organic broccoli comes from protein. It is important to note that the body does not build muscle from protein – it builds it from red blood cells. Muscle, bone, and all organs and glands are made from red blood cells NOT protein! Tony is a strong advocate and walking testimony of Dr. Young’s alkaline lifestyle and diet which he teaches from the stage at ALL his events. Prince Harry and Meghan follow the pH Miracle Alkaline Lifestyle and Diet. In fact it was Meghan who introduced Harry to the alkaline lifestyle. So what keeps Tom Brady so healthy, fit and strong at the age of 41 and still playing NFL Football? The answer is the pH Miracle alkaline lifestyle and diet! The wonderful benefits of ancients grains like quinoa, millet, buckwheat and spelt, they are low in carbohydrate (sugar) and higher in protein. Keep in mind though I only recommend these grains sparingly and no more than 10 grams of protein daily. Remember, all body cells, including bone and muscle are made from blood NOT protein. 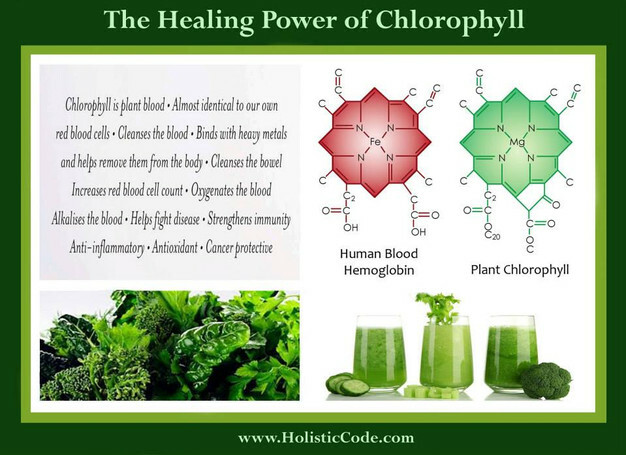 And blood is made from chlorophyll (green foods), unsaturated oil, alkaline water and mineral salts or sodium, potassium, magnesium and calcium. Jessica Biel credits her super svelte physique down to the Paleo diet. Heavily endorsed by Pete Evans, the diet works on the ethos you go back to eating like a caveman and eradicate dairy, grains and legumes from your diet. “Eating Paleo just leans you down and slims you up and takes that little layer of fat and water-weight right off your body,” says Jessica. “I do a lot of cooking at home using fresh fish or lean meat like chicken and vegetables,” she adds. The Paleo diet will provide short term benefits but long term damage from ALL the acidic foods from dairy, legumes and grains such as wheat. You are better off with both short and long term benefits by sticking with a diet that does not cause eventual gland, organ and tissue damage. That diet would be low carbohydrate, low protein and liberal amounts of healthy unsaturated oil, like hemp seed, flax seed, broccoli seed, carrot seed, cabbage seed, just to name a few. Unfortunately this diet also has short term benefits with long term damage, especially to the intestinal villi if you are ingesting animal protein which does not digest (unless you juice the animal flesh). Maybe that is why Kim looks bloated in the lower abdominal area. It is important to stay away from this diet unless your protein sources are from green plants such as avocado, broccoli and buckwheat. Check out the above list of foods to avoid and especially avoid animal sources for safe and healthy weight loss. The World’s Number 1 Lifestyle and Diet for Health, Energy, Vitality, Fitness & Beauty! Maryanne lost over 150 pounds in less than a year following The pH Miracle for Weight Loss. Scott Jacobs lost over 100 pounds in 12 weeks following The pH Miracle for Weight Loss lifestyle and diet plan. Ryan Marcotte lost 31 pounds of fat and gained 11 pounds of muscle in 12 weeks following Dr. Robert O. Young’s pH Miracle Lifestyle and Diet! Donna lost over 100 pounds following Dr. Robert O. Young’s pH Miracle Lifestyle and Diet! See Donna’s before and after pictures below as she shows her new found energy doing the splits on the Jump Sport Rebounder. Can You Prevent or Reverse Any Cancerous Condition With Lifestyle and Diet? Lung Cancer is the Number 1 Killer in the World Today and is Preventable with Lifestyle and Diet! What is the number 1 cancer killer in the World today and can it be prevented! If you are thinking lung cancer then you are right! It is now responsible for up to 90 percent of ALL cancers! American Cancer Society recommends that cancer survivors eat a plant-based alkaline diet! 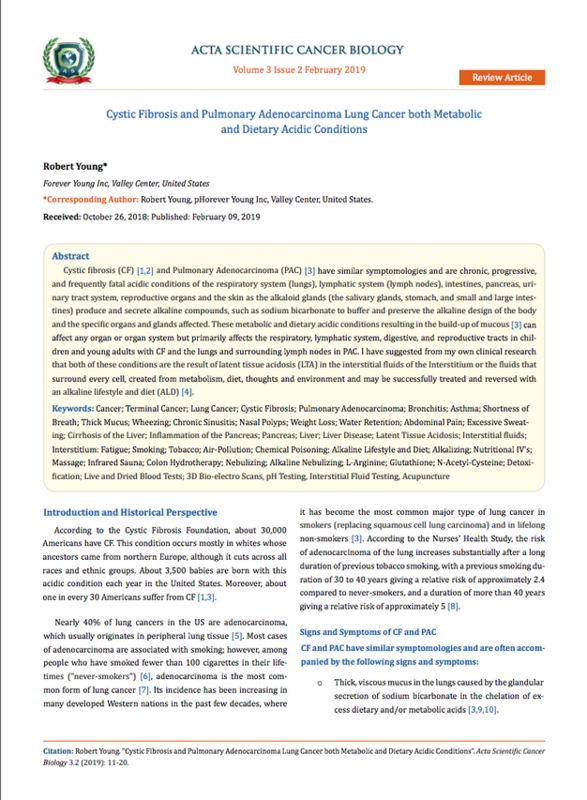 Apigenin found in parsley transformed 86 percent of all acidic cancerous lung cells! Apigenin found to inhibit the acids that cause breast and prostate cancer cells “immortality,” reprogramming them into mortal cells that die naturally! If you desire to incorporate more of these apigenin foods into your diet, try adding parsley to a juice, salad, soup, or main dish. If you have a juicer, follow this simple recipe below or if you do not have a juicer, just add parsley to your favorite green smoothie recipe! To learn more read the following story of Inger who reversed her terminal metastatic lung cancer following the non-invasive pH Miracle for Cancer and is still alive today after 7 years. She was given a zero prognosis from her doctor who diagnosed her with Pulmonary Adenocarcinoma Lung Cancer! New England Patriots quarterback Tom Brady — a five-time Super Bowl Champion and three-time NFL MVP — is widely considered to be one of the greatest athletes of all time. Lately, however, Brady has been following an alkaline lifestyle and diet. In September 2017, Brady released his book, The TB12 Method: How to Achieve a Lifetime of Sustained Peak Performance. In this book, Brady detailed exactly what he eats every day. One main feature of his diet is liberal amounts of alkaline foods and liquids. In the mornings, Brady doesn’t eat a full meal. When he wakes up at 6:00 am, he drinks 20 ounces of alkaline water infused with electrolytes, including sodium, potassium, magnesium and calcium. He then drinks a smoothie and/or juices containing alkalizing grasses, vegetables, fruit, nuts and seeds. Two hours later, he has another glass of alkaline electrolyte-infused water, and a post-workout protein shake. Brady claims to drink somewhere between 12 and 25 glasses of alkaline water per day. He also heavily encourages snacking. He usually snacks at around 11:00 am, just before lunch. For lunch, Brady will usually have a piece of fatty fish like salmon and a lot of green vegetables. In the afternoon, he may have another protein shake or protein bar, and around 6:00 pm, Brady eats dinner, which, again, consists of mostly green vegetables. His book provides recipes for green juices, green soups, green salads, and a few carbohydrate recipes such as his pasta dish — which is odd, considering that he supposedly rarely eats carbs. But even Brady treats himself sometimes. He doesn’t often eat dessert, but he does give a recipe for his famous alkaline avocado ice cream. His book also contains several alkalizing rules for eating. Brady won’t eat carbohydrates and protein together. He recommends eating carbs or protein with green vegetables instead, as he knows that this is better for assimilation and elimination. Brady’s chef Allen Campbell says that 80 per cent of his diet is green vegetables and the rest of his diet is grass-fed organic steak and wild salmon. Brady follows what he refers to as an alkaline lifestyle and diet created by Robert O. 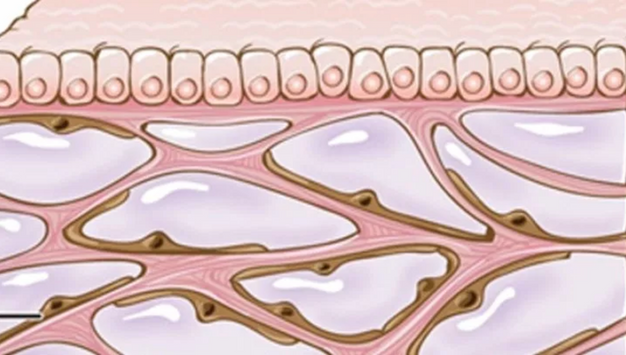 Young PhD, in order to minimize muscle inflammation caused by the buildup of lactic acid in the interstitial fluids of the Interstitium (see illustration below). This entails limiting ‘acidifying foods,’ which mostly includes starchy foods like potato, pasta, bread and ALL dairy products. What is even more interesting is the list of acidic foods that Brady doesn’t eat. For Brady, caffeine, white sugar, white flour, dairy, and some nightshade vegetables — eggplant and mushrooms — are completely off the table. He also won’t consume olive oil if it’s used in cooking — but he’ll have it raw. And he won’t eat high sugar fruit, unless it’s in a smoothie. Since there are profound benefits with Brady’s pH alkaline diet, and it is clearly sustaining his play on the field, there a 100’s of specific health and fitness benefits of the pH alkaline lifestyle and diet which are backed by published scientific evidence. He claims that limiting acidic foods helps control the body’s pH balance. What one eats, drinks, breaths and thinks has a huge effect on the body fluids, including the blood plasma, interstitial and intracellular fluid pH which is ideal at 7.365. Brady also knows that the alkaline lifestyle and diet can decrease the lactic acids that causes inflammation in the body, leading to ALL sickness and disease, including connective tissue disorders that can end an athlete’s career. At 41 years young, which is considered ancient in football years, Brady says he wants to play at least another five years. While he is certainly capable, his pH Miracle lifestyle and diet will be a major reason he WILL achieve HIS goal.